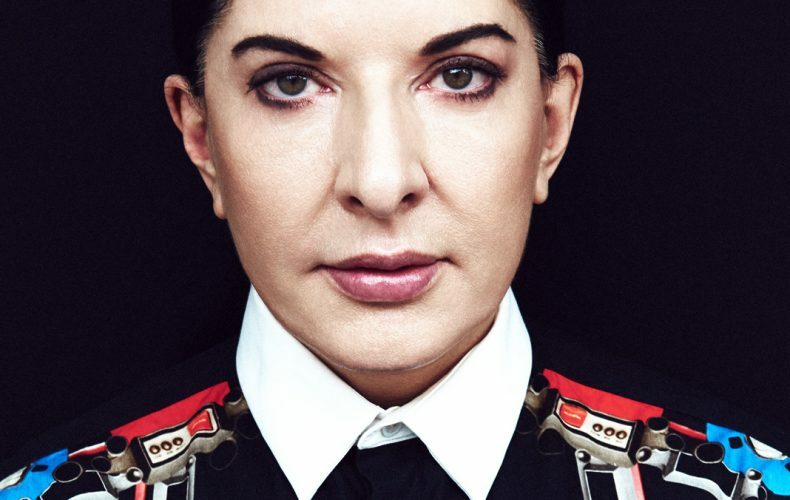 Marina Abramovic, a New York-based pioneer of performance art, became the hottest news early 2018 when she announced what she intended to do for her upcoming exhibition at the Royal Academy of Art in London in 2020. No, it will have nothing to do with living in an art gallery for days, or sitting in a chair for hundreds of hours, or looking strangers in the eye like in 2010. It will be entirely something new, a performance art show that will see Marina Abramovic being charged with electricity, a lot of electricity. The project is a collaboration with the Spanish art fabrication company Factum Arte to make art specifically for her exhibition in London. It will involve as much as one million volts of static. For that, Abramovic will be the first woman artist to occupy the entire main gallery of the 250-year-old Royal Academy of Arts. 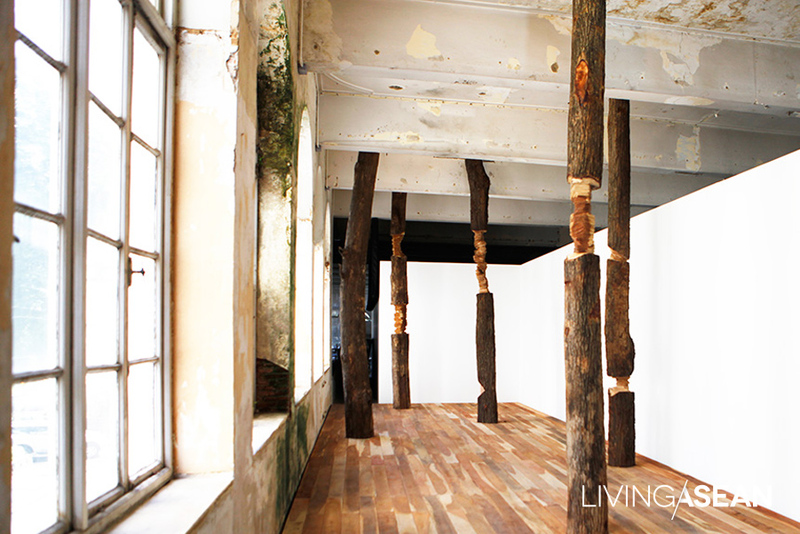 People who are unfamiliar with the artworks of Abramovic may softly ask if she is crazy. Of course, not. To help you understand her innovative ideas and what she stands for, our baanlaesuan.com team presents a glimpse into her life and work. Some of her groundbreaking masterpieces are exhibited along with those of 75 other artists as part of the Bangkok Art Biennale 2018. The country’s inaugural art festival is going on now and runs until February 3, 2019. Marina Abramovic was born in 1946 in Belgrade, the capital of Serbia back in the day when it was part of a federation of republics known as Yugoslavia. After World War II ended in 1945, vast swaths of Europe were reduced to ruins and life under communist revolutionary Josip Broz, a.k.a. Marshal Tito, was tough for its citizens. But Abramovic’s family was safe and sound, albeit a far cry from being a happy one. She could still recall that her parents had a terrible marriage during a 2013 interview. Her parents became national heroes and were given positions in the post-war Yugoslav government. Her father was a high-ranking official in the security apparatus that protected the Yugoslav dictator, while her mother was director and curator of an art museum in Belgrade. Despite her mother’s strict military style control of the household and an unhappy childhood, Abramovic developed an early interest in art and began painting as a child. She graduated from the Academy of Fine Arts in Belgrade in 1970 and went on to complete post-graduate studies in Zagreb (now capital of Croatia) in 1972. At age 27, she returned to Serbia and taught at the Academy of Fine Arts and began making art for her first solo performances. 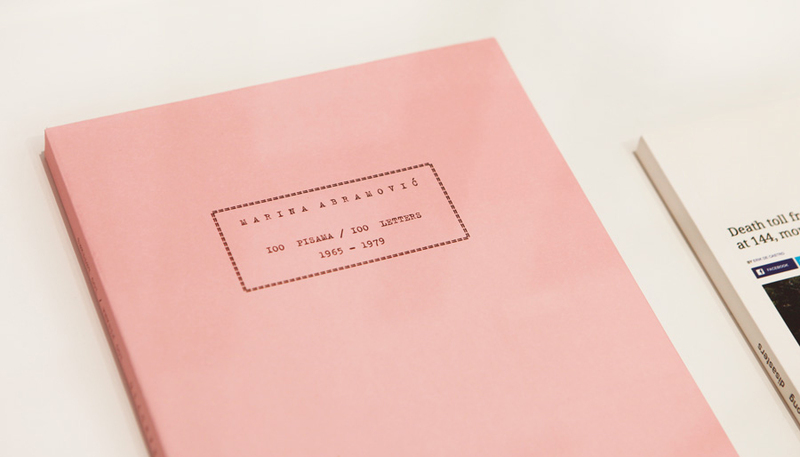 Marina Abramovic, 100 Picasa / 100 Letters: 1965-1979, a compilation of letters she received while living in Belgrade. The book is on display at the Art Books Fair 2018 at Bangkok CityCity Gallery. Abramovic became known for staging a work of performance art, called “Rhythm O”, at Studio Morra in Naples, western Italy in 1974. 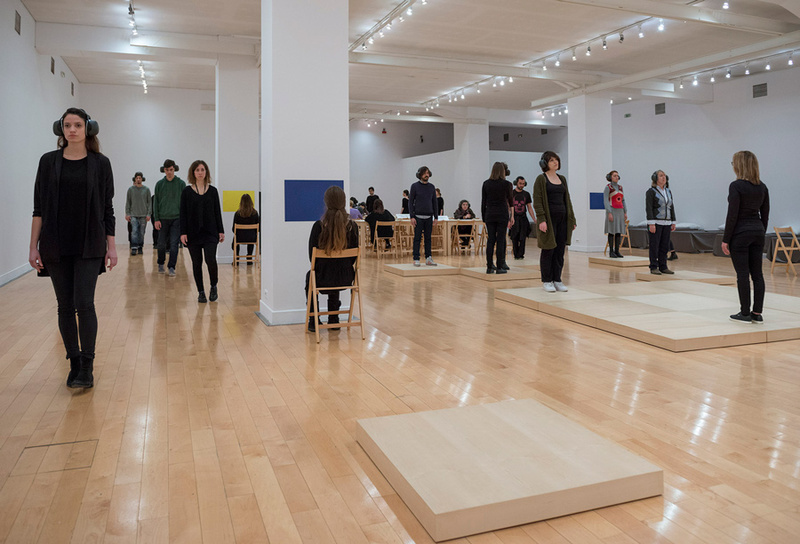 The exhibition involved Marina Abramovic standing still for six hours while the audiences were allowed to do anything they wished to her using one of 72 objects she had put on the table. They included, among other things, bread, roses, honey, nails, a scalpel, scissors, even a pistol with a single bullet in it. Dubbed one of her most challenging events, Rhythm O was a show that tested the limits of the relationship between the performer and audience members. It began gently. But later on as the show turned ugly, one person picked up a gun and aimed at her head, and another person jumped in and took it away. At the end of the day, her body sustained a fair amount of injuries from being attacked and treated badly. No doubt it was an experience that pushed her body to the limits. Here is a video clip in which the artist talked about Rhythm 0. (Warning: The images and content may be disturbing to individuals under age 18.) Check it out. Unlike most communist countries in Eastern Europe, post-war Yugoslavia had a liberal travel policy permitting foreigners to travel freely through the country and its citizens to travel worldwide. On the breakup of Yugoslavia in 1990, Serbia remained in federation with Montenegro until 2006 when they split and became two separate republics. 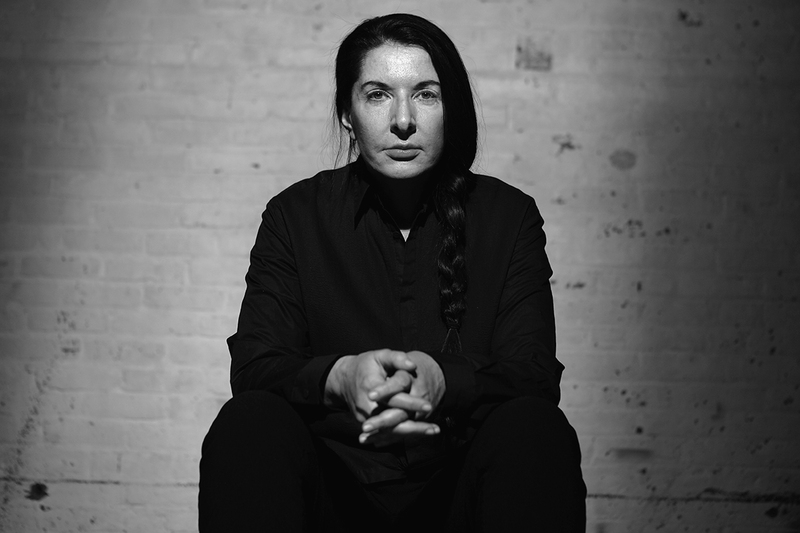 Marina Abramovic left Belgrade forever in 1979 first for Amsterdam, and then New York. Two years after Rhythm 0, Marina Abramovic staged another performance at a show called “Relation in Time”, at Studio G7 in Bologna, Italy. 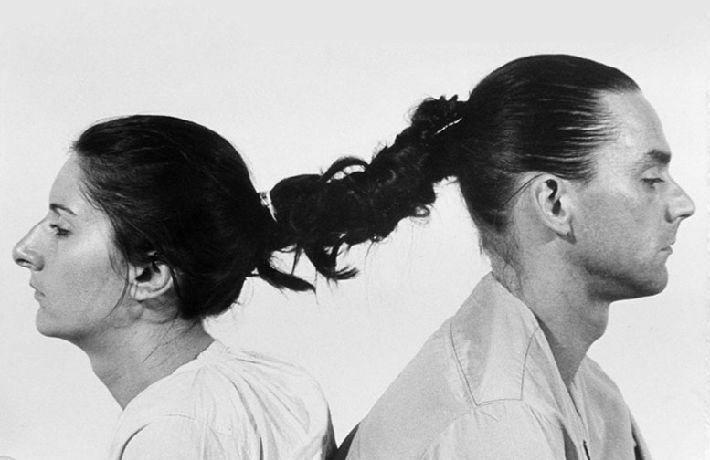 A part of the live exhibition involved Abramovic and then-partner Ulay sitting together back-to-back with their ponytail hair tied together in a 16-hour marathon. They sat silhouetted against a bare wall witnessed by the audience until the final hour. Like Abramovic, Ulay also developed an interest in pushing the human body to the limits. 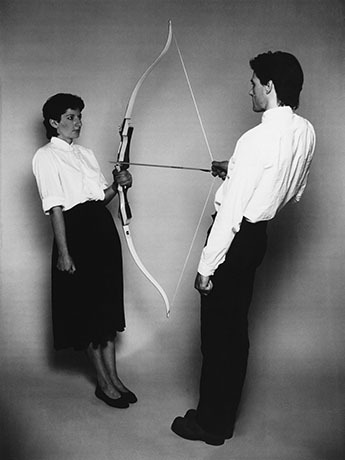 In 1980, Marina Abramovic and Ulay came up with another performance art show called “Rest Energy”. 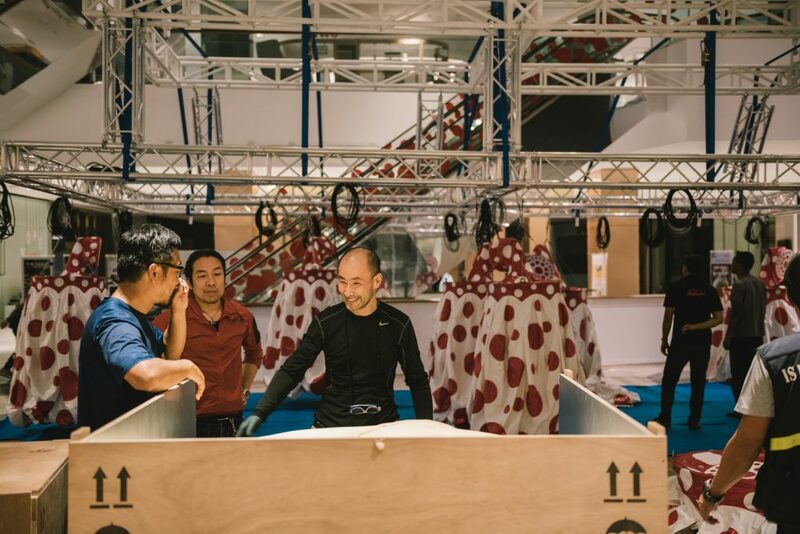 The show involved severe tests of endurance that pushed the human body to the limits, while exploring human bonds and human behavior at the same time. 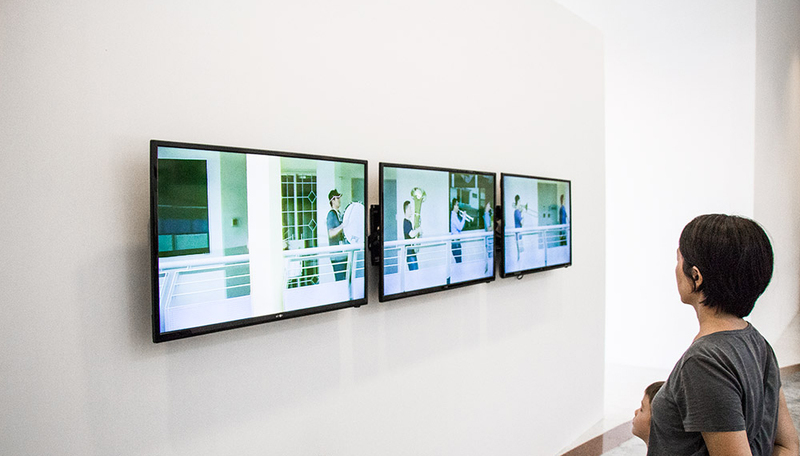 The 4-minute live exhibition placed Abramovic at the receiving end of an arrow while Ulay held the trigger. The crux of the matter was about the difference between life and death and mutual trust. Albeit short-lived, collaborations between the two artist partners produced some of the most intriguing works of art that the world has ever known. But everything good finally came to an end. In 1988, “The Lovers: The Great Wall Walk” became their last joint project, in which they went on a long arduous journey from different locations and came to meet at one point on the Great Wall of China where they said goodbye. Marina Abramovic became a sensation once again in 2010 with her groundbreaking durational work titled “The Artist Is Present” hosted by the Museum of Modern Art (MoMA) in New York City. The artist gave live performances from March to May that year, during which she sat in silence at the table throughout the run of the show for a total of 736 hours. All day Abramovic would not respond to anything that the people did to distract her. Yet, museum visitors were willing to stand in line for hours awaiting their turn to sit solo across from her and look her in the eye. Once they grabbed a seat, the audience members could sit there as long as they wanted. 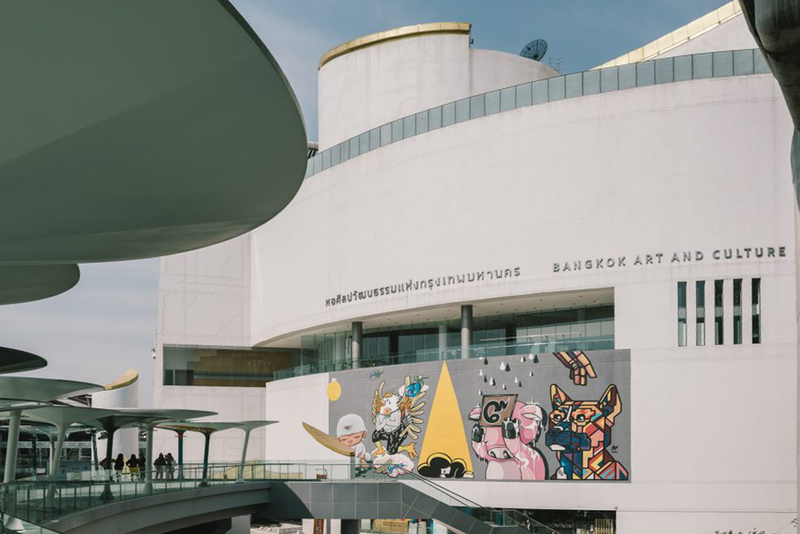 The Bangkok Art Biennale, which is happening now and runs until February 3, 2019, offers the opportunity of experiencing the amazing works of Marina Abramovic right here in Thailand. Her exhibits are on show at two separate events. First, the show titled “Standing Structures” provides a glimpse into the world of silent communication. It’s taking place at One Bangkok, a mega development project located on Rama 4 Road. 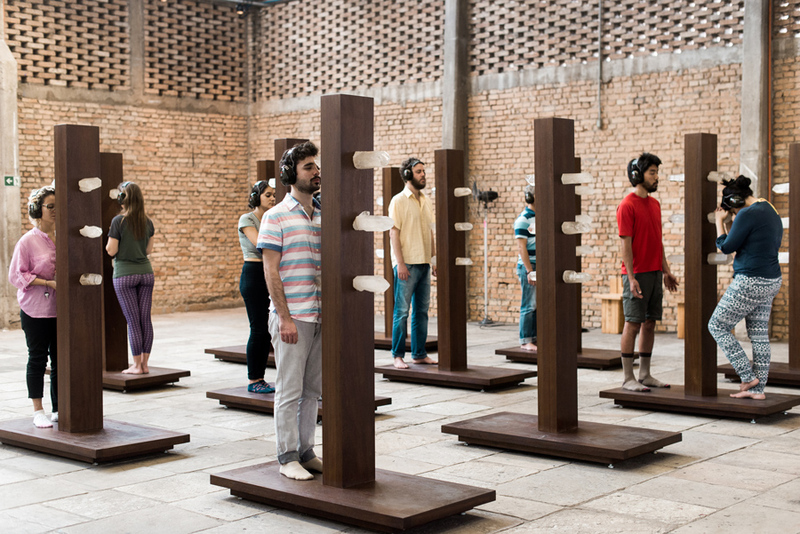 “Method”, the other show that involved an experiment about being present in time and space, was held from October 8 to November 12, 2018, and presented by a team from the Marina Abramovic Institute (MAI). 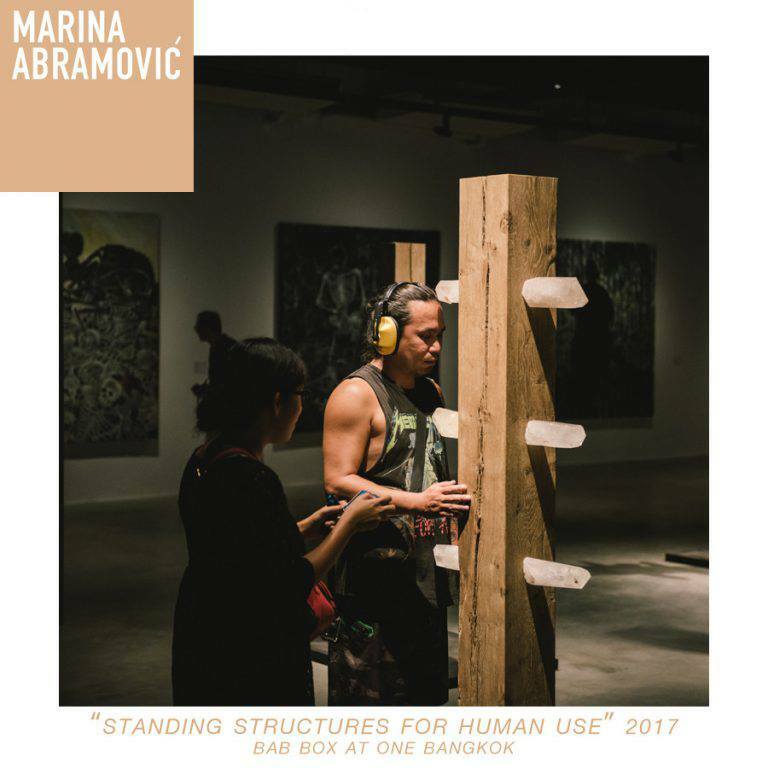 “Method” an experimental exhibition hosted by the Marina Abramovic Institute (MAI) took place from October 8 to Novemer 12, 2018 as part of the Bangkok Art Biennale. Jean-Michel Basquiat (1960-1988) is one of 75 artists whose works are exhibited at the Bangkok Art Biennale that runs until February 3, 2019. The American artist of Haitian and Puerto Rican descent went down in history as one of the most brilliant artists on the American art scene. 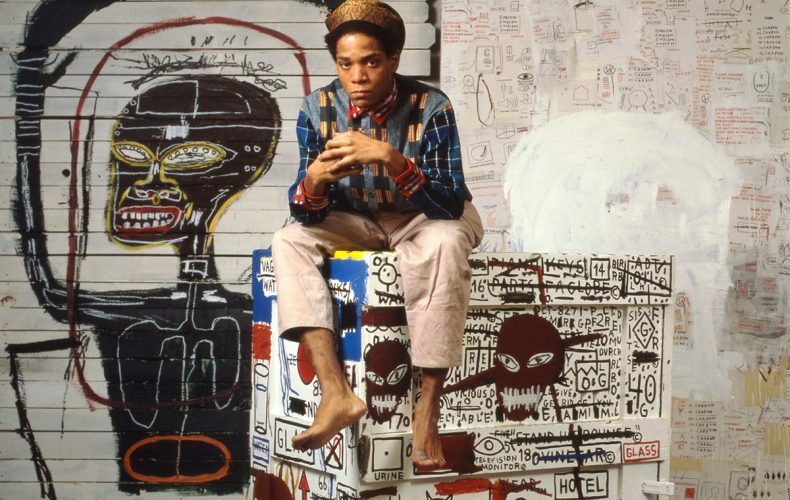 Born and raised in Brooklyn, Basquiat had a precocious talent for the arts as a child. His mother gradually established a love of art in her son by enrolling him in a junior course at a neighborhood art museum. The unthinkable happened. The boy soon grew and matured to take the art world by storm. One of his paintings sold in a 2017 auction for a record 110.5 million USD, about 3.5 billion Baht. Our baanlaesuan.com team investigates. Life was never easy or cozy for the hugely successful painter. At age 7, he was hit by a car while playing in the street. 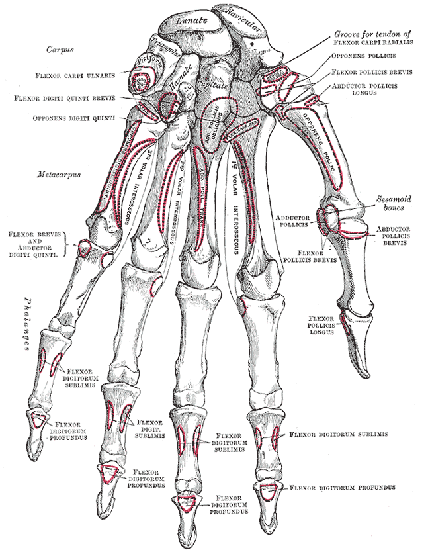 He broke his arm and suffered several internal injuries. To keep him occupied while in recovery, his mother brought him a book on anatomy by Henry Gray with illustrations by Henry Vandyke Carter. Who would have thought it turned out to have such a great influence on his art and for the rest of his life? Later that same year his parents separated, and he and his two sisters were brought up by his father in Brooklyn for a while. They relocated to Puerto Rico and moved back to Brooklyn two years later. At age 13, his mother was committed to a psychiatric hospital. He ran away from home at 15 only to be arrested sleeping in a city park and brought back to the family. He quit conventional schooling at age 17 to attend an alternative school for children with artistic talents. Even then he dropped out again. This time his father banished him from the household. He lived with a friend in Brooklyn and supported himself by selling T-shirts and handcrafted post cards. There were times when he survived on cheese that the bought for 15 cents a packet. Albeit far from being legendary at the time, Basquiat rose from humble beginnings to achieve fame after he met Al Diaz in the late 1970’s. Together they formed a graffiti duo known as SAMO, whose epigrams could be seen on walls and the surfaces of public places all over Manhattan’s Lower East Side at the time that punk rock, hip-hop and street art cultures were taking shape. They appropriated drawing, painting and poetry, and mixed text and image with social commentary. Basquiat and Diaz put an end to the SAMO project in 1979. Basquiat’s paintings gained recognition for supporting class struggle while resisting the Establishment, colonialism and systems of racism in America and beyond. His works appeared in several magazines in 1979 when he caught the attention of the television industry. Soon Basquiat was invited to appear on “TV Party” with Glenn O’Brien, and the rest was history. As his prestige and celebrity grew, he became a star and it appeared he enjoyed spending lavishly on haute couture clothing, among them Armani suits, and expensive accessories. The 1980’s was an eventful period for Basquiat. He had the opportunity of meeting Andy Warhol, a leading pop artist whose works spanned a variety of media. It was said that Warhol was so impressed after having seen some of Basquiat’s works that he wanted to collaborate with him one day. And they did. Basquiat also became a songwriter. He produced a rap single in 1983 and began his touring exhibitions across the US and Europe. At age 21, he was dubbed the youngest artist to have exhibited at the Documenta contemporary art show hosted once every five years by the city of Kassel, Germany. 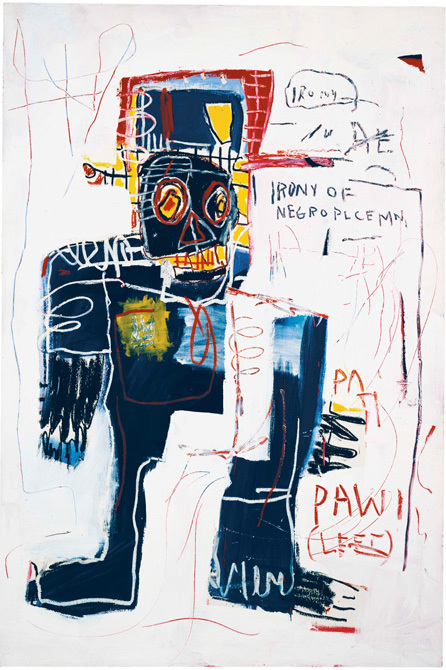 Basquiat reached the pinnacle of his career in 1985, dubbed the hugely successful artist on the American art scene. 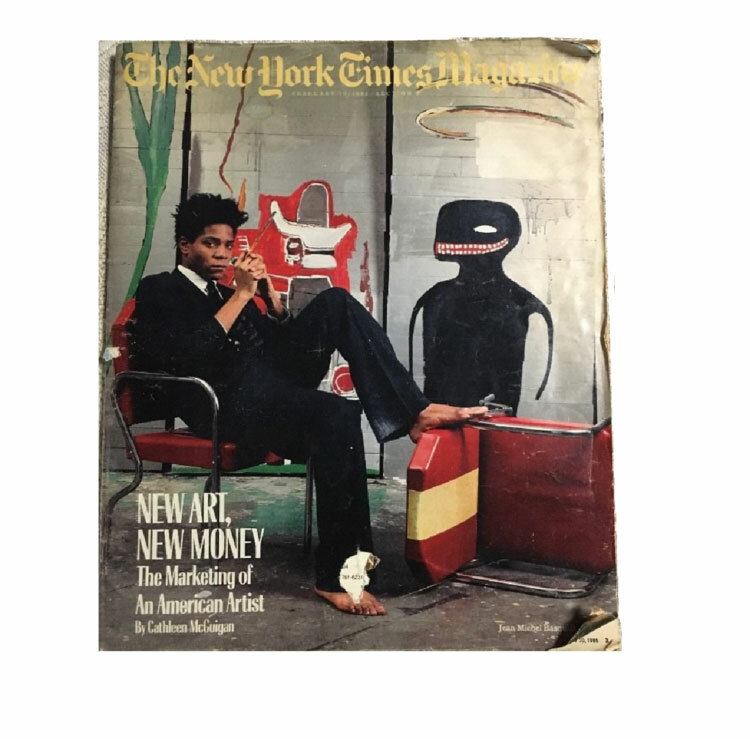 He appeared on the cover of The New York Time Magazine under the headline “New Art, New Money: The Marketing of an American Artist”. On the cusp of his fame, Basquiat dated Madonna, queen of pop, but when the short-lived relationship ended, it appeared the breakup was extremely unpleasant. 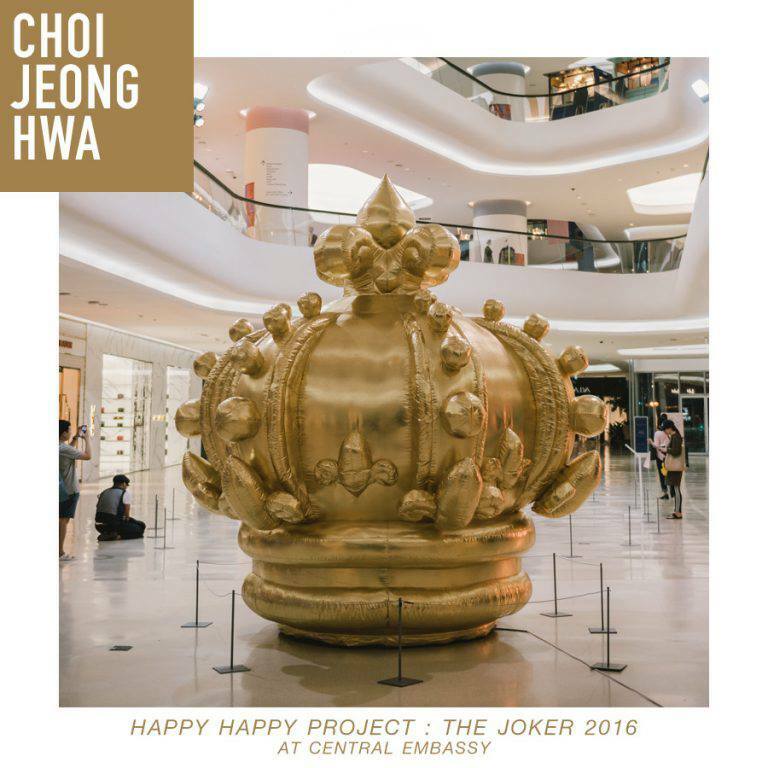 He made the singer-songwriter return the artworks he had given her and destroyed them all. At age 27, Basquiat died of a heroin overdose in his studio. 29 years later at a 2017 Sotheby’s auction, one of his untitled paintings depicting a skull sold for 110.5 million USD, roughly 3.5 billion Baht, setting a new record high of any American artist. Without a doubt, Brooklyn-born Basquiat was one of the most influential postmodern artists in the world and one of the highest selling American artists until now. Even after his untimely death, his paintings and everything he stood for – rigid dichotomies between rich and poor, black and white, and integration and segregation – lived on. His signature style – words that featured heavily in his drawings and paintings – was appropriated in many collaborations with leading fashion houses as well as clothing and accessory industries, among them Comme des Garcons, Uniglo, and Reebok. 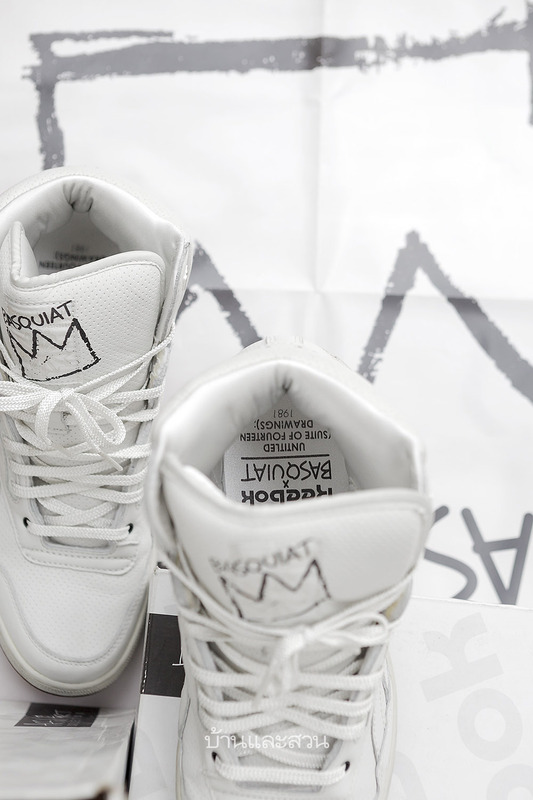 Here are some shoes with the name Basquiat embroidered on them. 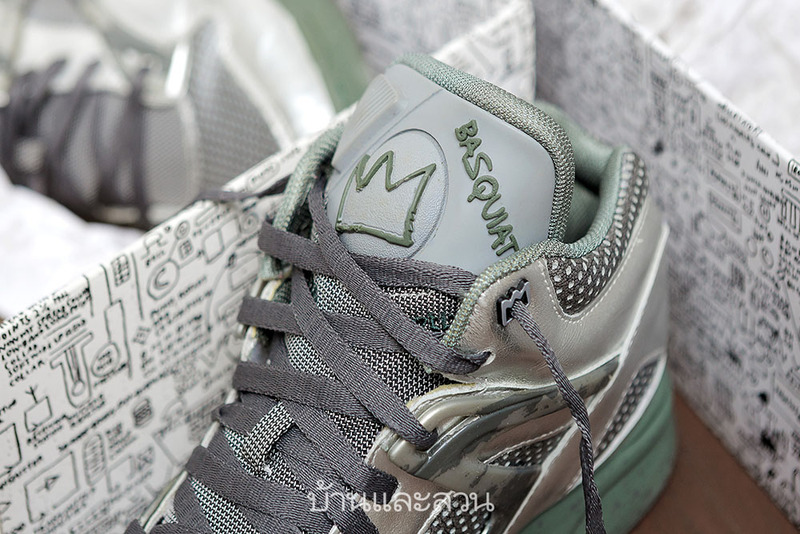 Designed by hip-hop artist Swizz Beatz (Kasseem Dean), Reebok’s Pump Omni Light shoes feature “Basquiat” and a crown symbol embroidered on them. The crown symbolizes majestic powers in traditional African belief systems. 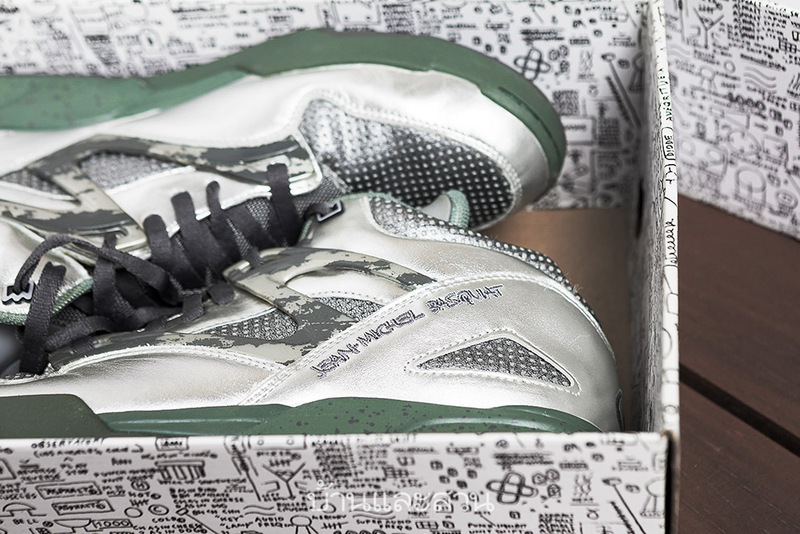 Reebok’s BB4600 HI model features Basquiat and a crown symbol embroidered on the tongue. An epitaph that says, “A Lot of Bowery Bums Used to Be Executives,” appears on the back tab. (Bowery refers to a street and a district in Lower Manhattan.) The left side says, “Ignorant Easter Suit,” adapted from one of his graffiti spray painted for the “Downtown 81” TV documentary directed by Edo Bertoglio and Glenn O’Brien, whom Basquiat highly admired. 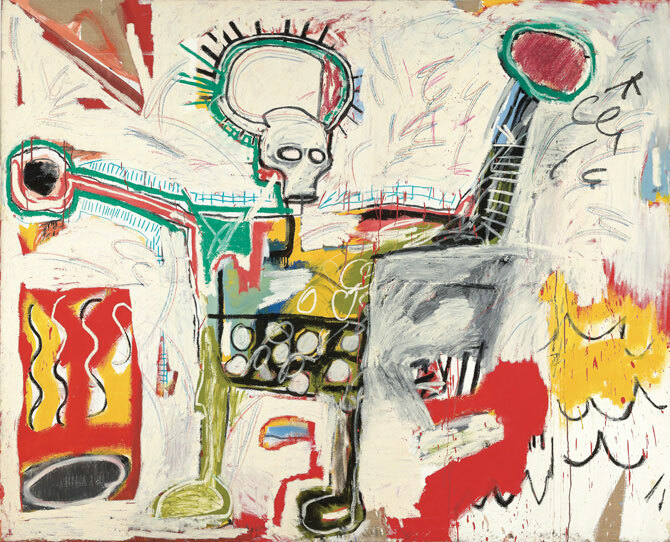 At a Sotheby’s auction in May 2017, one of Basquiat’s Untitled (1982) paintings depicting a skull sold for 110.5 million USD, about 3.5 billion Baht. The successful bidder was Yusaku Maezawa, a Japanese billionaire e-commerce entrepreneur and art collector. A Tweet by Yusaku Maezawa announces that he has bought the painting. The Japanese billionaire entrepreneur calls it “a love at first sight” and hopes to host an exhibition so other people can see it, too. 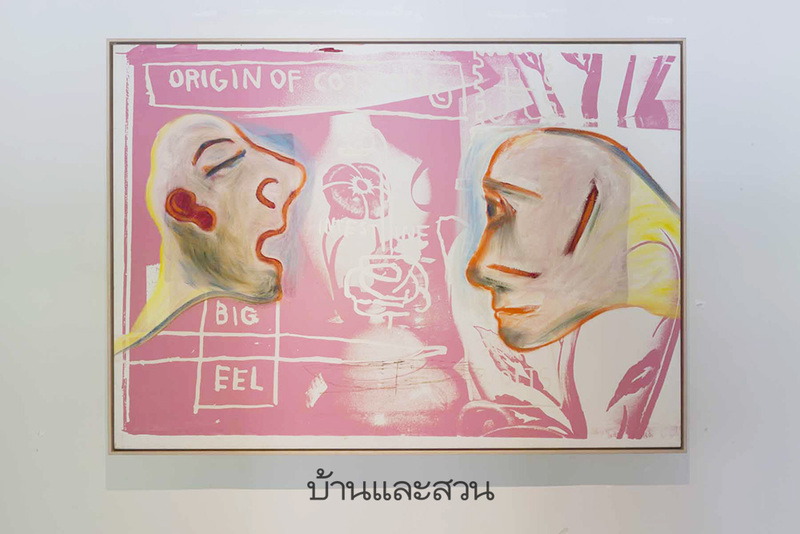 A product of collaboration between Jean-Michel Basquiat, Andy Warhol, and Italian Francesco Clemente, known as “Amorosi”, is on show at the Bangkok Art Biennale, which runs until next February 3. 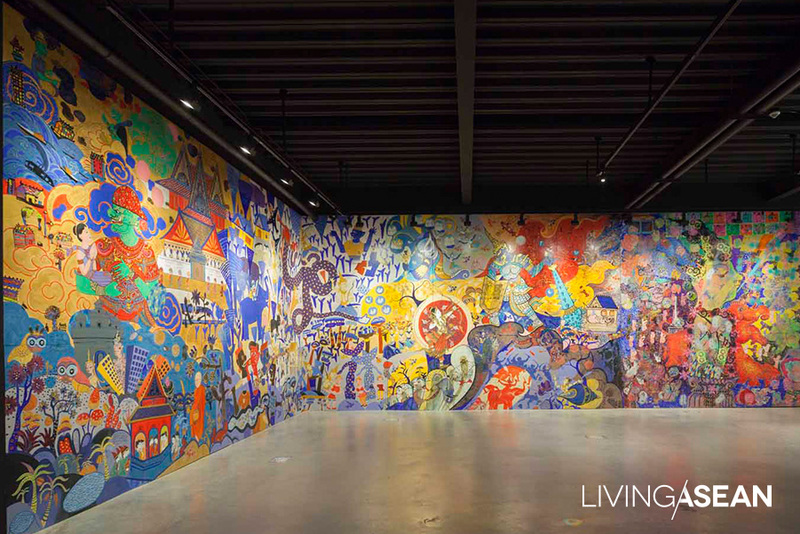 The mixed media painting, which includes oil sticks, acrylic, and silkscreens on a canvas that’s almost two meters long, is on the Second Floor of BAB BOX @ One Bangkok. The show is open from 10.00 to 21.00 hours every day except on Tuesday. 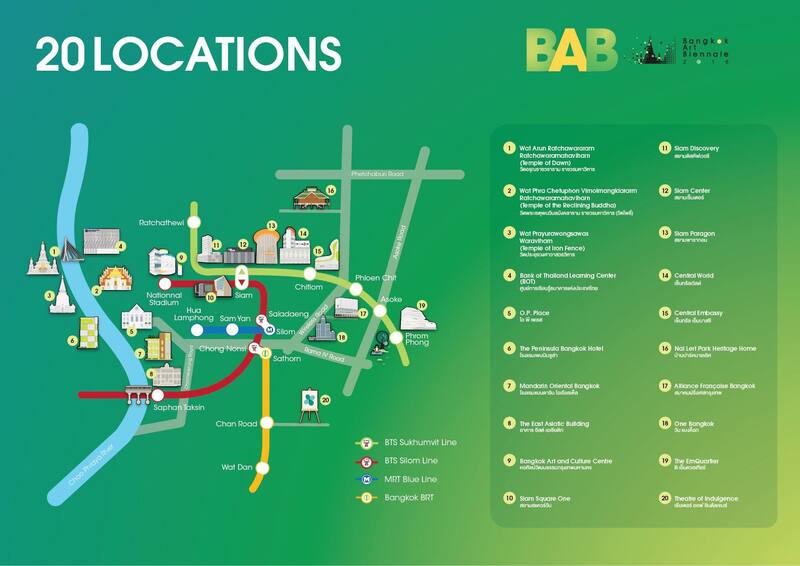 The venue is easily accessible via the MRT. Get off at Lumpini Station and take Exit 3. It’s a rare opportunity to see the work of such highly celebrated artists. Whilst there, drop into BAB Café for refreshing beverages and a meal or two. Be there. 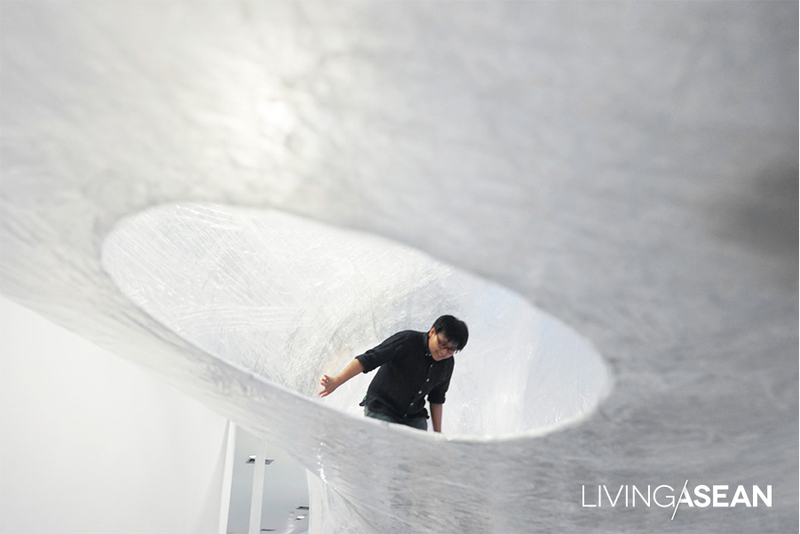 Born in 1964, Lee Bul is one of Asia’s most acclaimed artists renowned for her eye-catching contemporary sculptures and art installations. 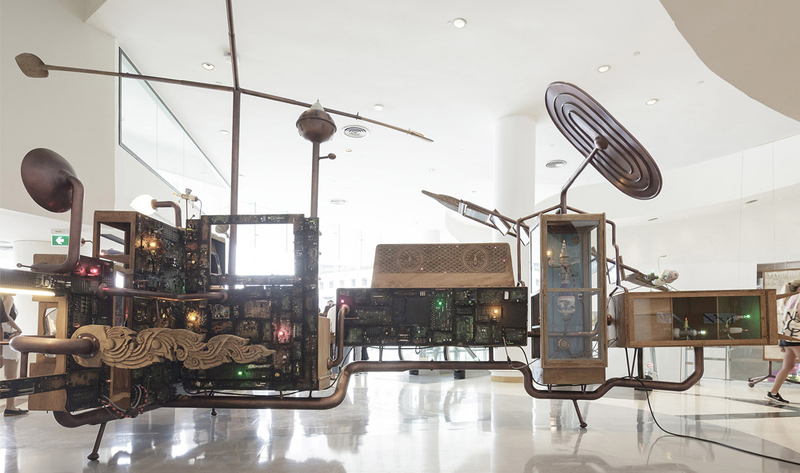 Some of her enthralling futuristic works are on view at the East Asiatic Building as part of the Bangkok Art Biennale that’s going on now and will run until next February 3. Blessed with a strong artist identity, the 54-year-old Korean is passionate about using mixed media to communicate messages to her active audiences. 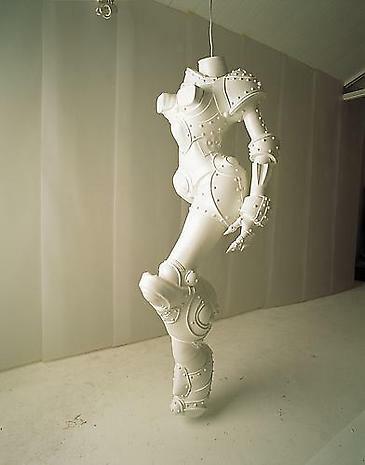 A 1987 product of the Hongik University Department of Sculpture, Bul achieved fame for questioning a system of society in which men held the power and women were largely excluded from it. For more than two decades, she developed artistic interests in geological change and the evolution of the human body that took place over millennia. Her energy and enthusiasm for the arts span almost all the conventional and modern disciplines, ranging from mechanical sculpture to performance art to site specific installations and fashion design. 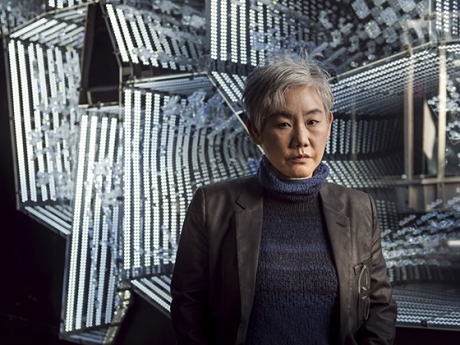 Lee Bul came to prominence for her though-provoking works that drew a comparison between two sharply contrasting ideas and the polarization of society. They ranged from individualism as opposed to group mentality, to light and darkness imagery that was used to contrast good and bad, to nature versus machines and facts as opposed to fantasy. She became concerned in social structure and environmental conditions, and grew her knowledge by visiting the locality before getting down to work. She searched for a utopia through her large-scale works of art that made reference to science fictions and technological innovations. 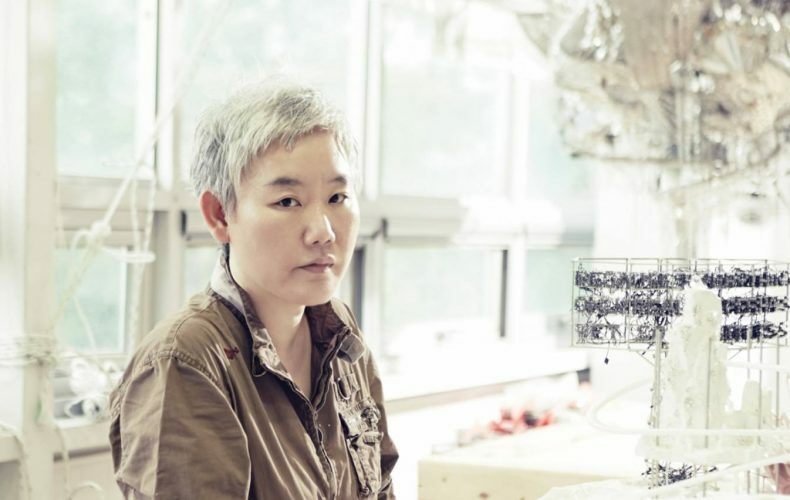 One of the clearest reflections of Lee Bul’s visions was “Willing to Be Vulnerable”, a colossal sculpture resembling a Hindenburg airship that she debuted at the 2016 Sydney Biennale. 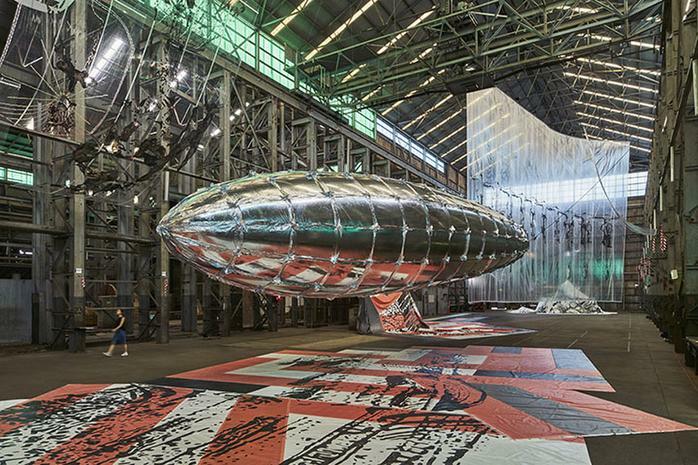 The futuristic metalized balloon was operated by machinery and required so much space that it had to be displayed in a warehouse. 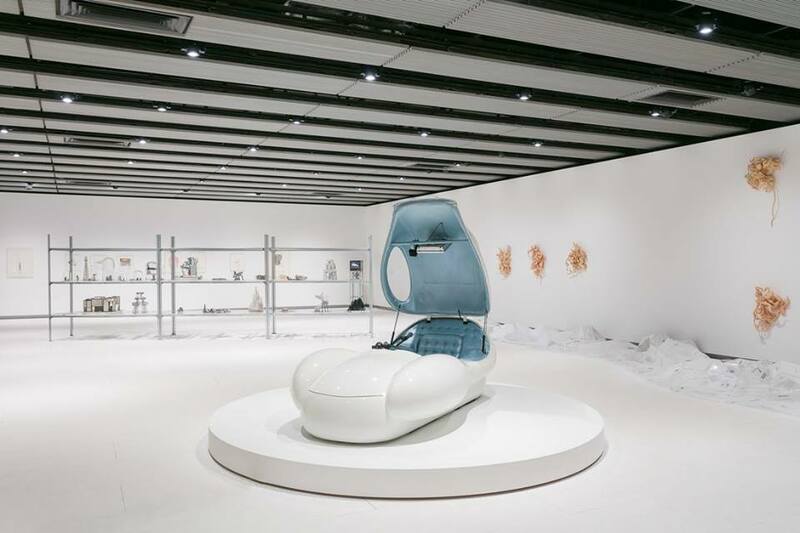 Resembling a Zeppelin that was popular in the 1930’s, “Willing to Be Vulnerable” is on view at the 2016 Sydney Biennale. The Seoul-born artist won popular acclaim once again when she participated in the 2013 Miss Dior Exhibition at Paris’ Grand Palais. Since then she has become a familiar face in fashion design collaborations. At the time she was among the ten famous artists, poets, painters and photographers who were invited to re-envision the iconic Lady Dior handbag. It gave her the opportunity of teaming up with the atelier of Christian Dior to reimage the bag originally designed in 1995. Her take on the elegant example of haute couture was a limited-edition handbag featuring a broken mirror effect that became her design signature. 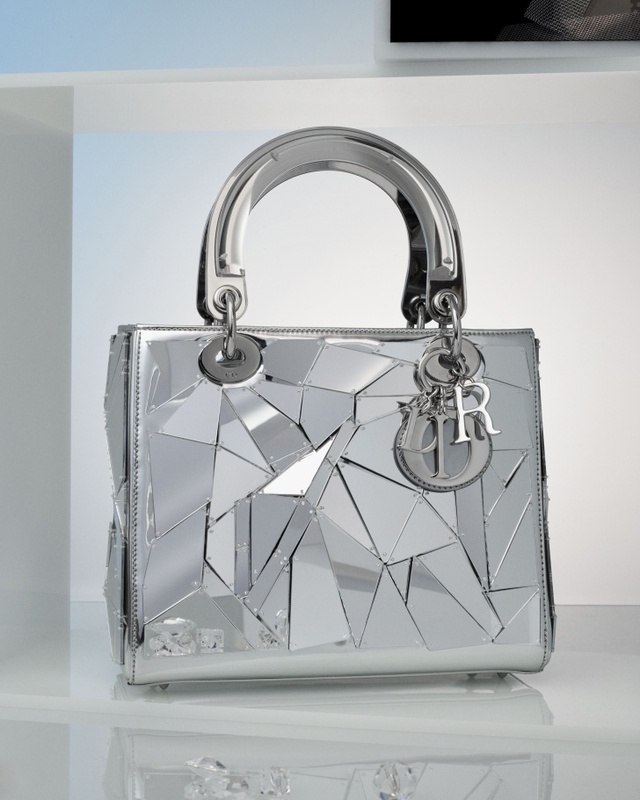 The bag was covered in pieces of Plexiglas material put together in a way that resembled a shattered mirror. Together, they reflected her interest in utopias, concepts of beauty and the paradox of human nature. Dior x Lee Bul, a product of collaboration between the Korean contemporary artist and the atelier of Christian Dior in Paris. It was her take on the reinterpretation of the iconic Lady Dior handbag the debuted in 1995. 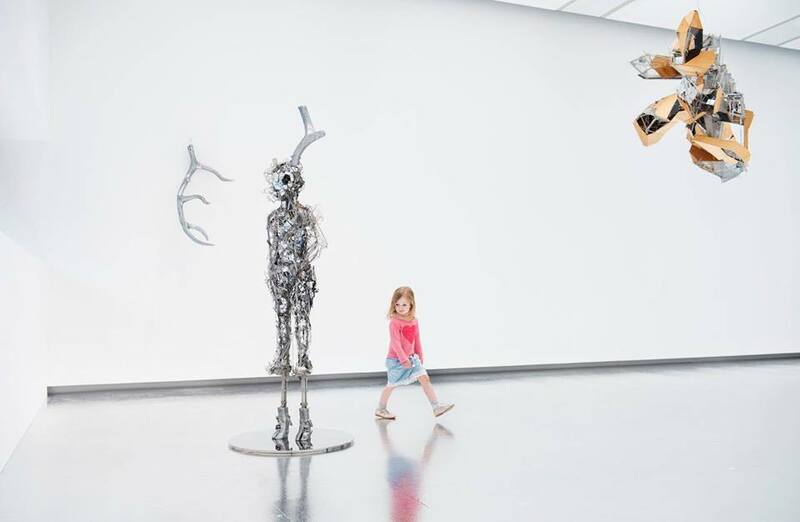 Lee Bul has exhibited at art galleries and museums worldwide, among them the Art Sonje Center and the Samsung Museum of Art in Seoul, the New Museum of Contemporary Art in New York, and the National Gallery of Victoria in Melbourne, Australia. 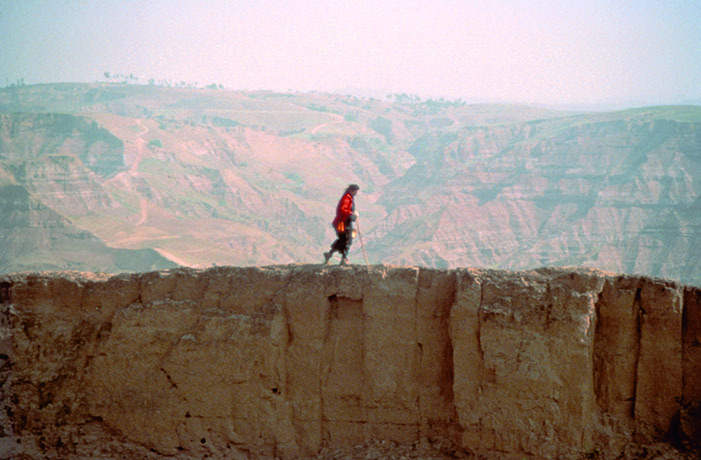 Her major exhibition “Mon grand recit: Weep into Stones” 2005, was hosted by London’s Hayward Gallery on its 50th anniversary in 2018. 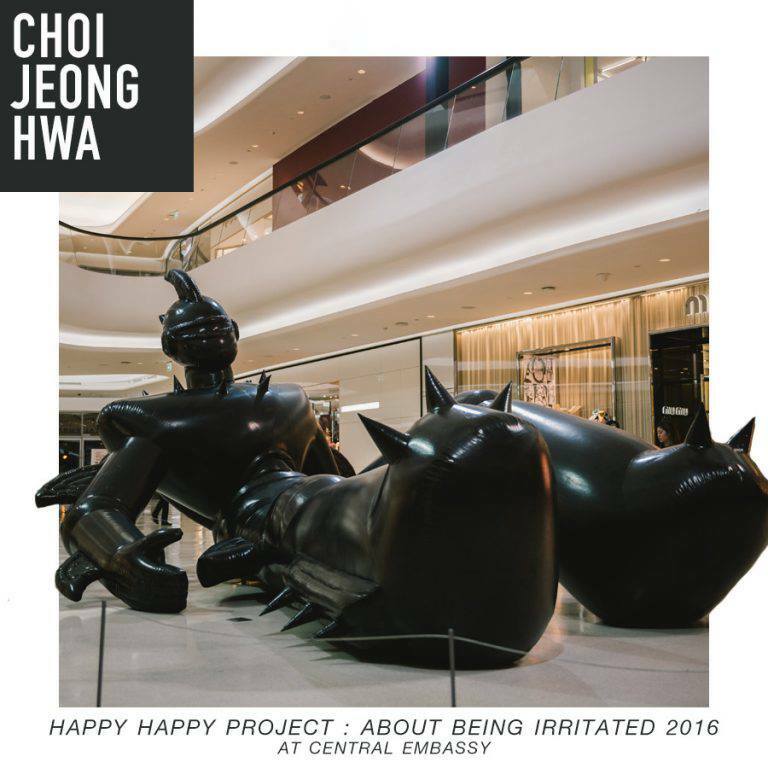 The show was a big success, lighting up the gallery inside and out transforming it into a dream-like landscape filled with what looked like traces of authoritarian devastation from her memory of 1970’s Korea and the effects of modernization on the environment. Her clear and direct visions of change were manifested in colossal architectural installations that have become her distinctive character. 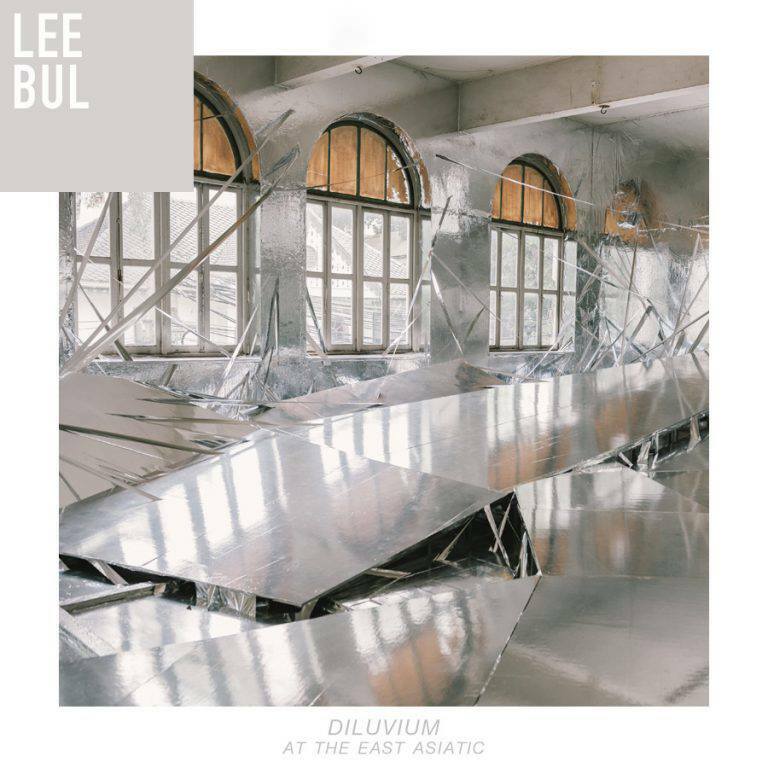 One of Lee Bul’s masterpieces, a monochromatic architectural installation titled “Diluvium”, is on display at the East Asiatic Building as part of the Bangkok Art Biennale. The show runs until next February 3, 2019. The name has a Latin root meaning floods and over time has come to refer to a barren landscape supposed to have been caused by glacial drift. 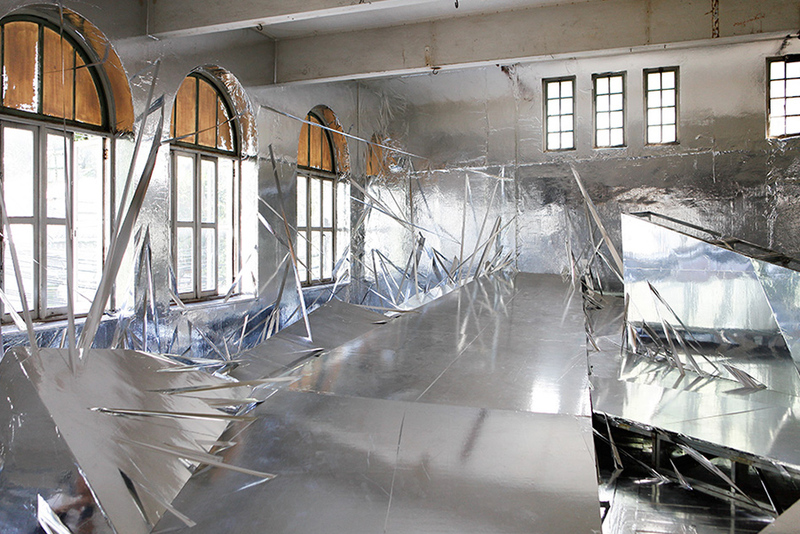 The eye-catching installation is made of silver vinyl sheets randomly connected to a crushed framework of metal beams depicting a trail of destruction. It reflects the artist’s interest in geological change and her vision of cataclysm in the natural world. 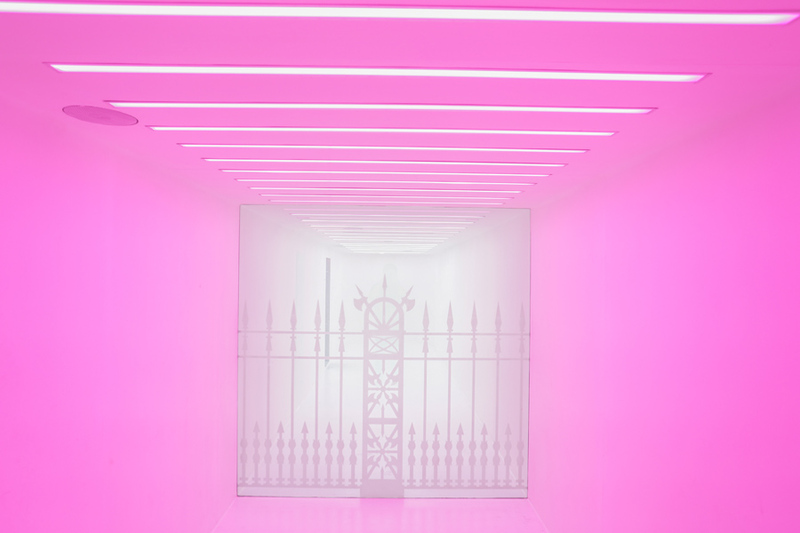 All things considered, it’s a show that turns the entire exhibition space into a monster. It’s in town now. So, what are you waiting for! How Will This Work: “City of Art” Exhibits in Temples? Without doubt art has origins in faith and belief: the earliest cave murals and sculptures indicate rituals relating to nearly all aspects of life, and many of these evolved into religions and faiths of various kinds. Art works since have played a great role in the transmission of belief and faith, to the point where, by inference, art works are expected to manifest a sort of religious expression. 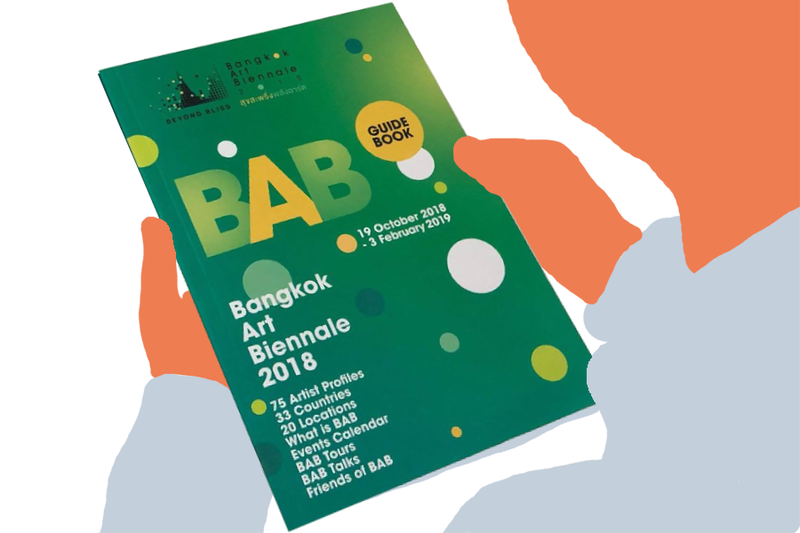 Bangkok Art Biennale 2018, or BAB 2018 marks the first time a major world festival of contemporary art has graced Bangkok with its exhibits for an extended period of time. 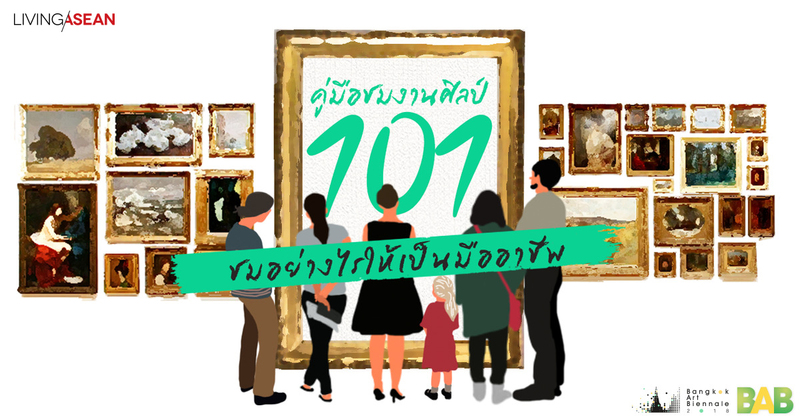 Featuring contemporary works of more than 70 both Thai and international artists, Bangkok is hosting Festival showings at 20 locations from October 19, 2018 to February 3, 2019. 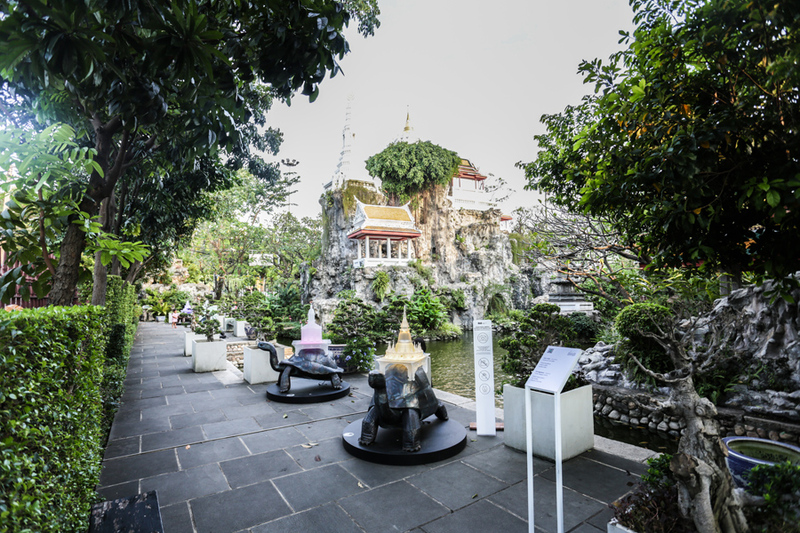 Exhibition sites range from the financial district office buildings to local communities, and, most significantly, to Bangkok’s temples, a cultural heritage for which Thailand is famous throughout the world. 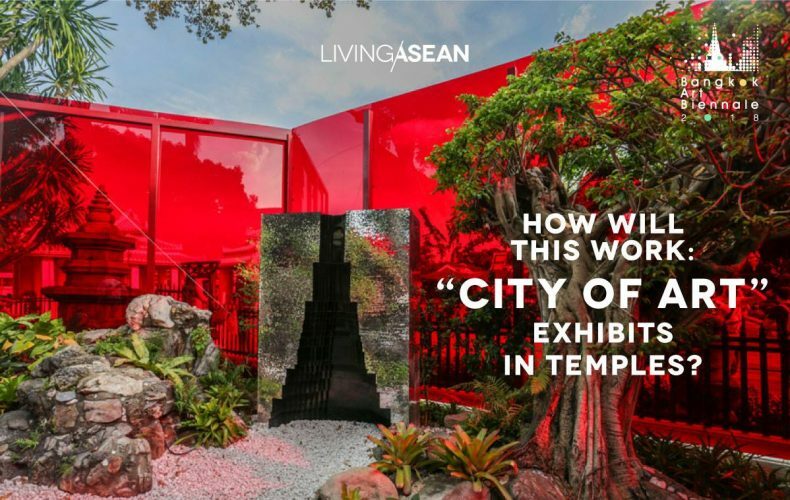 It seems fitting, then, to give our friends at Living ASEAN a glimpse of some of BAB 2018’s most creative art that is on exhibit in some of our most beautiful temples. 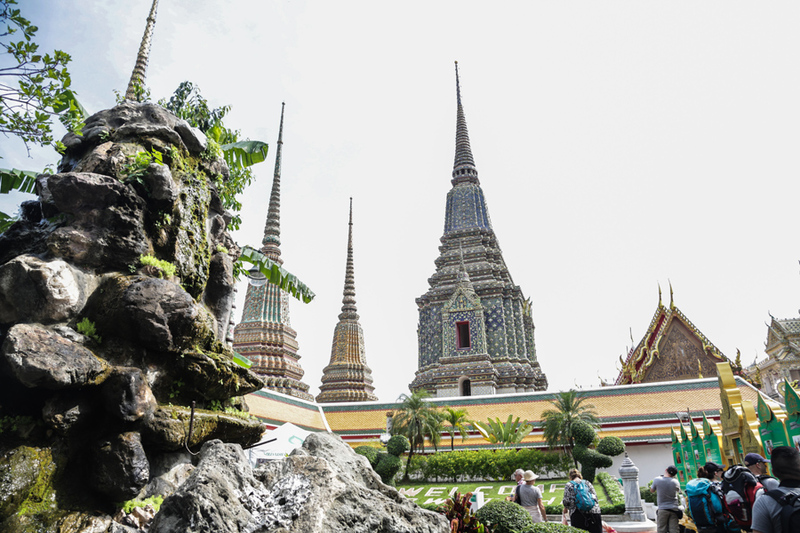 Here we bring you to your first stop, the exhibits at Phra Chetuphon Wimolmangkalaram Ratchaworawihan Temple, or “Wat Pho.” This was the official temple of the first king of the Chakri Dynasty, H.M. Rama I, and is world-renowned for its beauty and historical value. Most Thais and foreigners alike want to come at least once to experience its beauty. 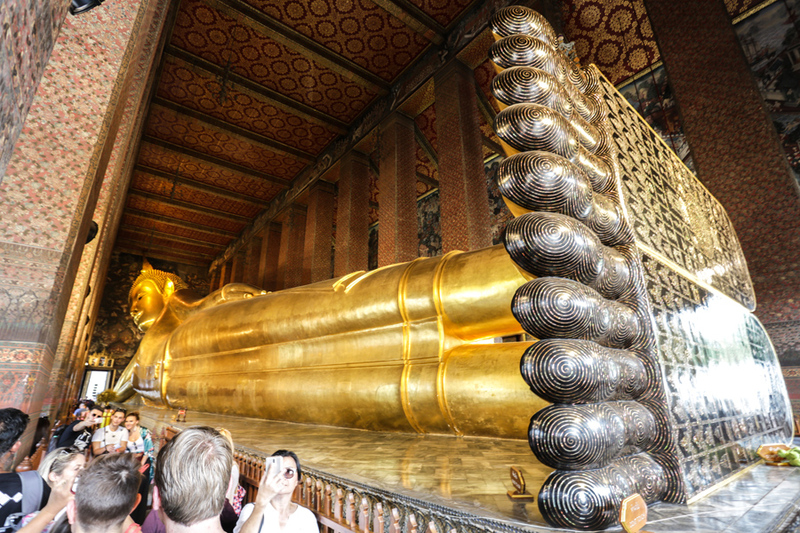 The Temple of the Reclining Buddha was built in the era of Rama I, with its primary image of worship “Phra Phuttharoup Proht Surin Sathu,” known popularly as “the Reclining Buddha.” The sculpture is 46 meters long and 15 meters tall. 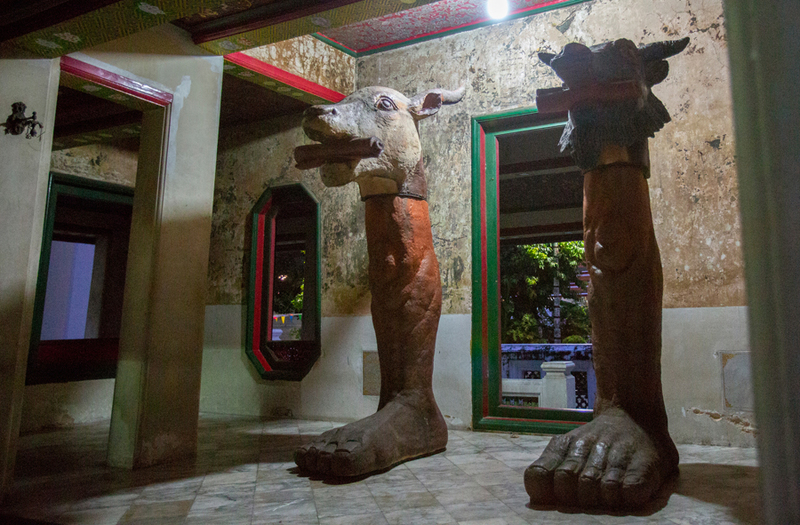 Each of its feet is 1.5 meters wide and 5 meters long and is decorated in 108 spots with pearls and auspicious images. The base of each of The Four Reign Chedis has notched corners, and the chedi is identified with a glazed tile showing the name of one of the first four Siamese kings: “Phra Maha Chedi Si Sanphet Yadayan” (Chedi of Rama I), “Phra Maha Chedi Dilok Dhammakaroknitarn” (Rama II), “Phra Maha Chedi Munibat Borikhan,” (Rama III), and “Phra Maha Chedi Song Phra Srisuriyothai” (Rama IV). 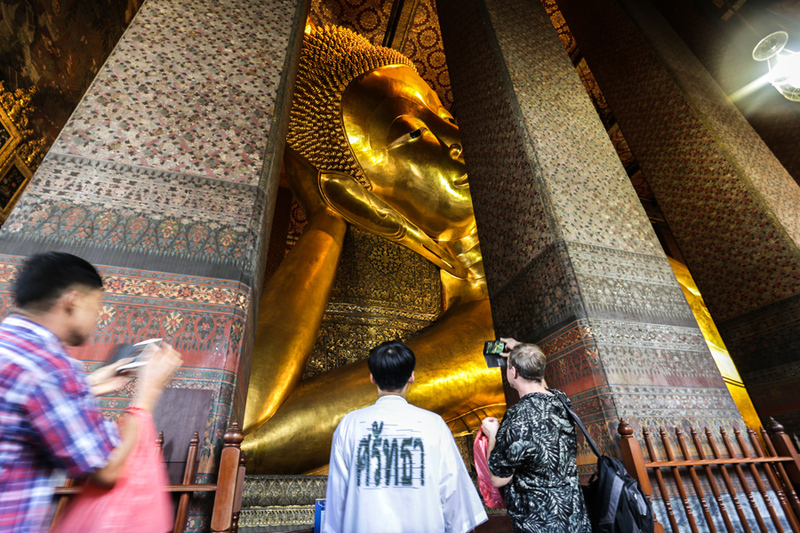 Wat Pho, aside from its beauty and historical value, is associated with the remarkable traditional medical arts and wisdom that have been handed down as a national heritage since the Ayutthaya period. The Rishi Statues were placed there in the time of the first Chakri king to demonstrate traditional medical arts with figurines posed in more than 80 different attitudes, though at the moment only 24 of these remain. 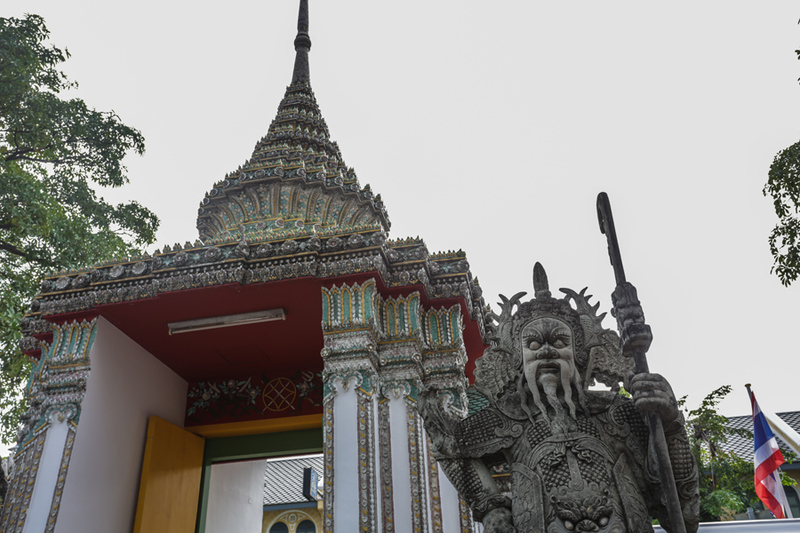 The Wat Pho Giants are another highlight of this world-famous temple, giant statues personifying characters from the Ramakien epic colored red and green, located at the entrance to the Phra Mondop scripture hall. 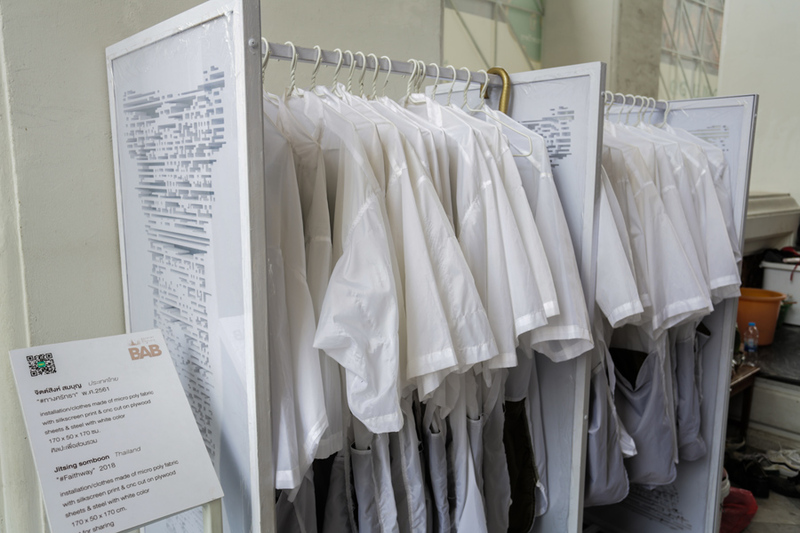 Paths of Faith is a collection of white robes with the word “Faith” in Thai, English, and Chinese on the back. These are hung for tourists to wear while visiting the Hall of the Reclining Buddha. 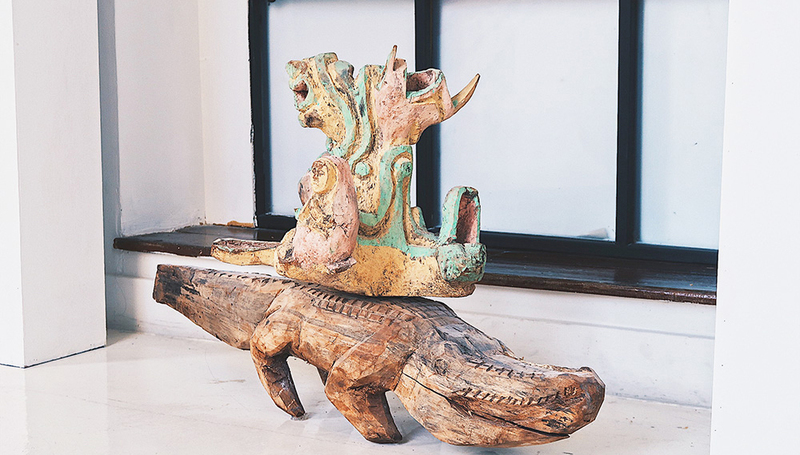 It is well known that most of Huang Yong Ping works involve stories based in Chinese culture, and Zuo You He Che is no exception. It is a sculpture of imaginary animals holding scrolls in their mouths signifying wisdom, faith, and healing, all paths to peace and contentment in Buddhist and Chinese philosophy. Knowledge in your Hands, Eyes and Minds is a mixed media (picture, scent, sound) art work located in a monk’s hut at the Wat Pho crocodile pond. It speaks to relationships between various traditional branches of knowledge: medical, design, literary, authorship, herbal massage, astrology, and communication between monks and the dead and dealing with the world after death. 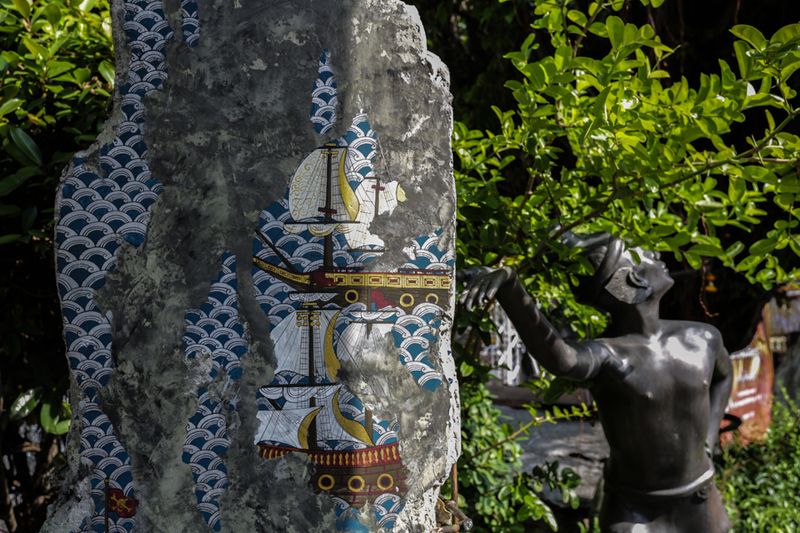 Sediments of Migration is a free-standing sculpture in one of the rock gardens, where it is paired with the Rishi statuettes healing their bodies in contorted poses. 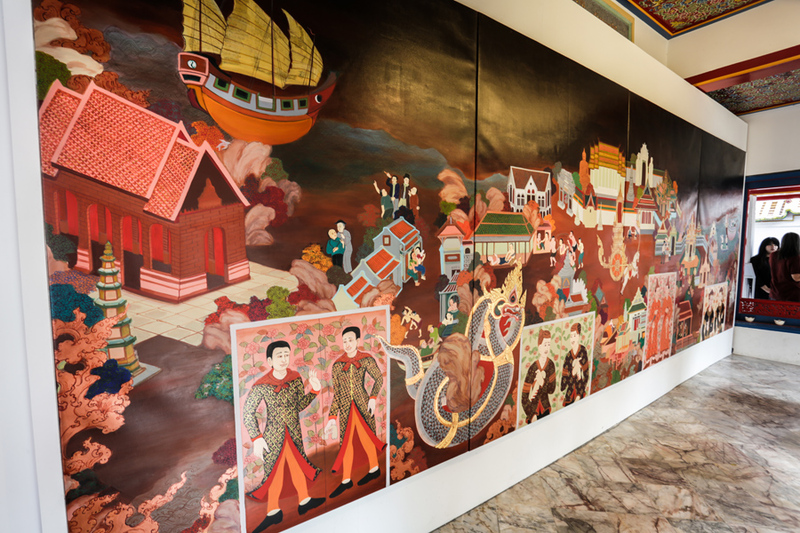 Sediments was inspired by murals within the temple itself, and depicts commercial travel between Siam and China with contrasting views of merit, faith and, ethnicity. 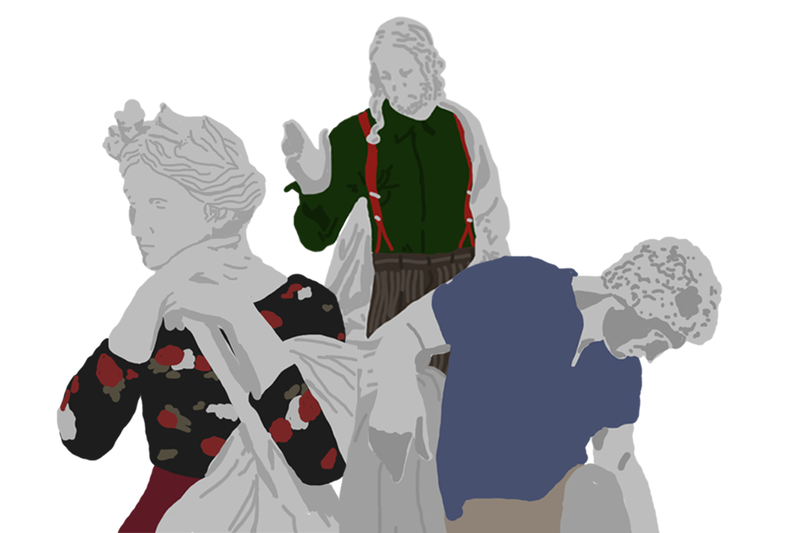 A Shadow of Giving is an experimental sculpture inspired by two-dimensional murals in poorhouses. It symbolizes giving, unselfishness, and respect. 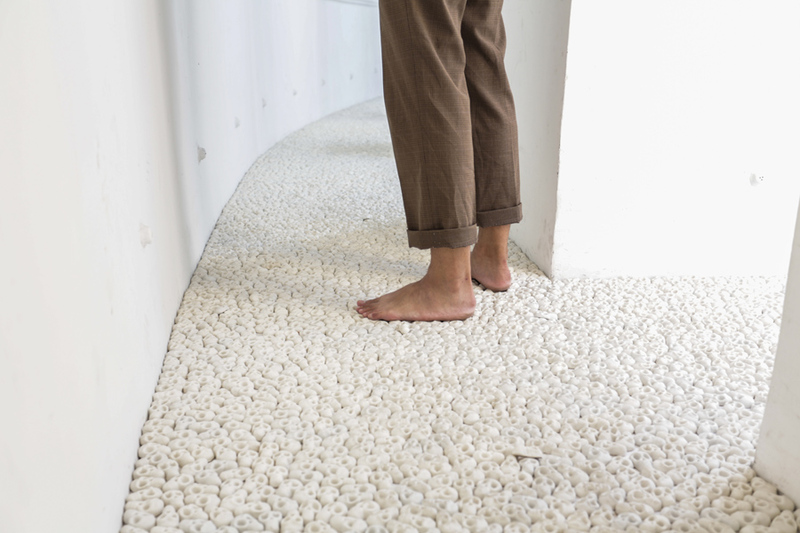 For the artist, accuracy of scale and mathematical fundamentals are a path to happiness. 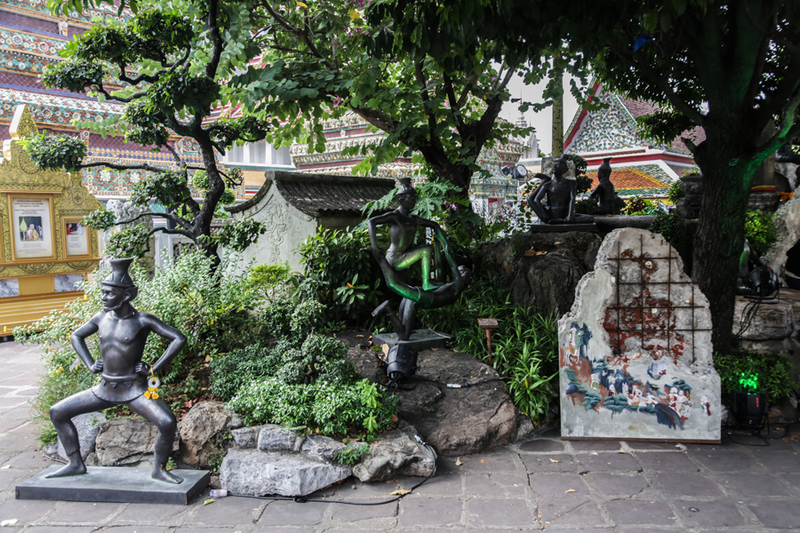 Important Highlights of Wat Arun are …. The Central Prang of Wat Arun is a prime example of Thai sacred architecture. 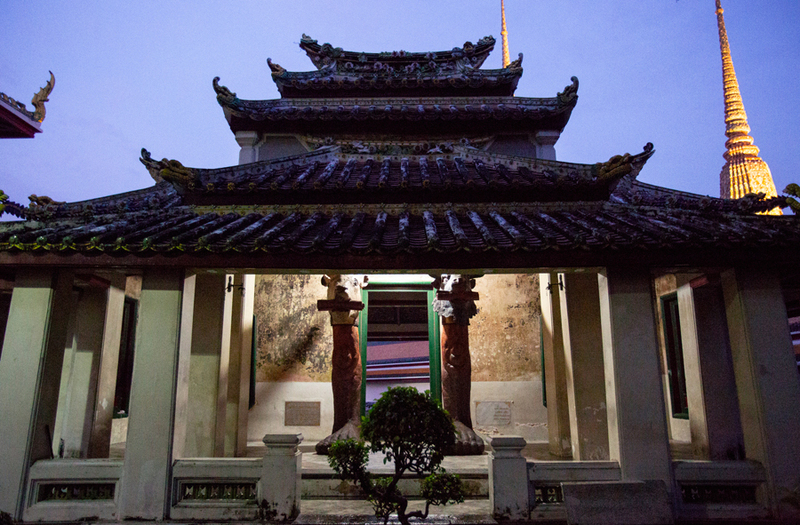 There is a main prang and four secondary ones, all of mortared brick adorned with seashells, glazed tiles, and beautiful Chinese benjarong designs, replete with representations of mythical figures such as kinaree, giants, angels, and garudas. 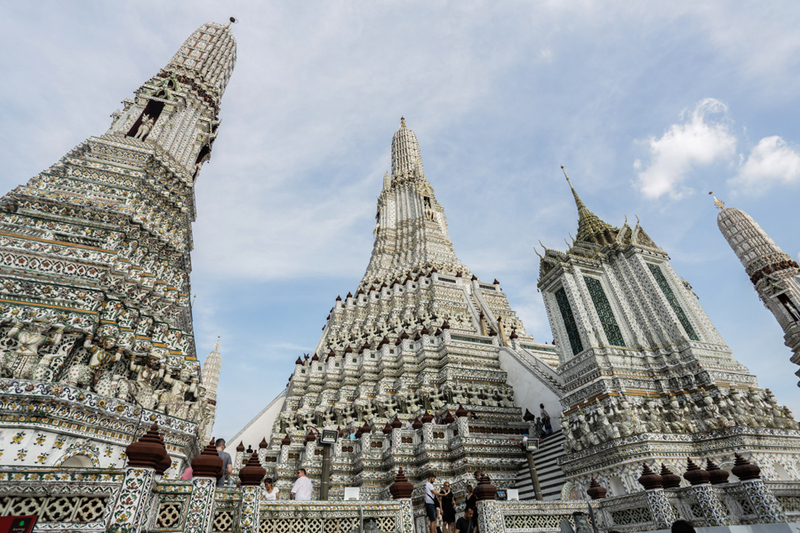 The Central Prang of Wat Arun was also refurbished in the time of Rama II, when the Wat Arun Central Prang was raised from 16 to 81.85 meters, making it the highest in the world. The Wat Jaeng Giants are among of Thai Buddhism’s most famous statues, no less than the Wat Pho Giants. 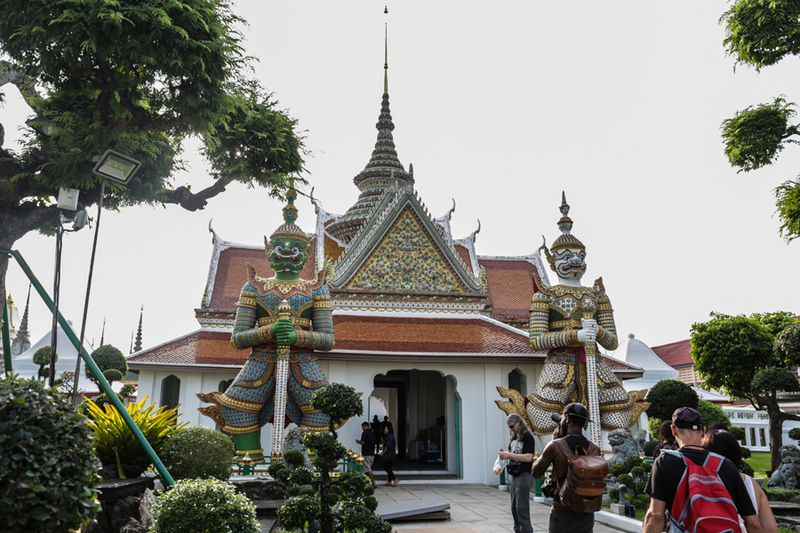 The Wat Jaeng giants represent the giants Thotsakan (green) and Sahat Decha (white) from the Thai epic Ramakien, and shine in their glazed tile apparel as they stand guard before the entrance gate to the ordination hall. 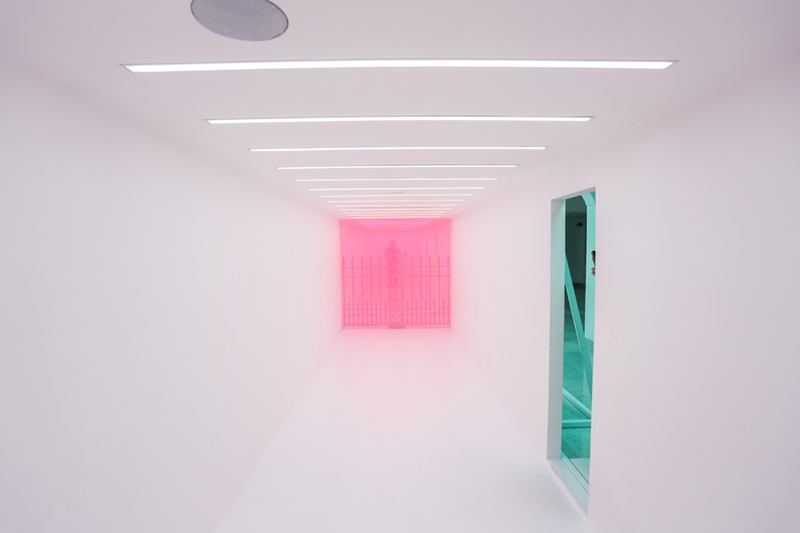 Across the Universe and Beyond brings lost and forgotten principles to life again, as the designs of space and light call on visitors to look within themselves when they step into the area. This installation art piece is intended as a reminder in this moment of existence, impermanence, and emptiness, for us reflect on ourselves as simply particles in the vastness of the universe. Inspired by the stone statures of ancient Chinese warriors and divinities, as well as people and animals China sent to Siam, the art work Giant Twins is a mixture of China and Siam. 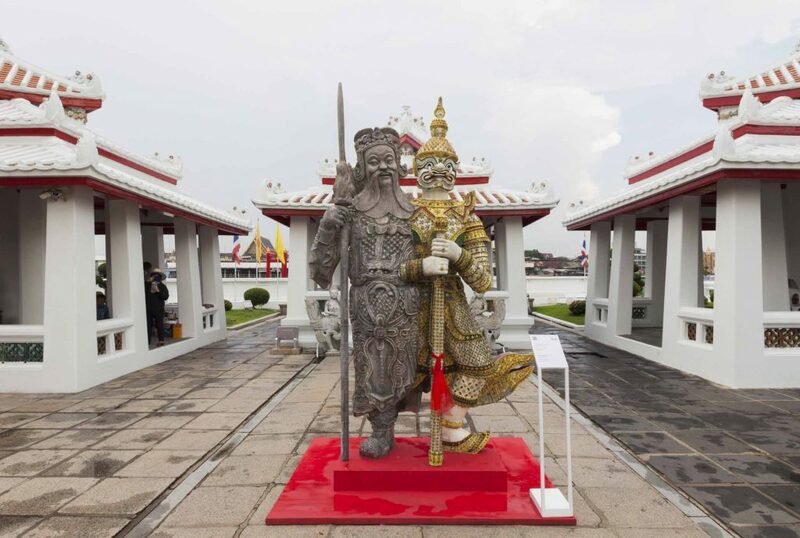 It recalls the legendary Siamese Twins Eng and Chang, as these two historical figures are transformed into the shape and form of giant warriors to symbolize Thai-Chinese relations. 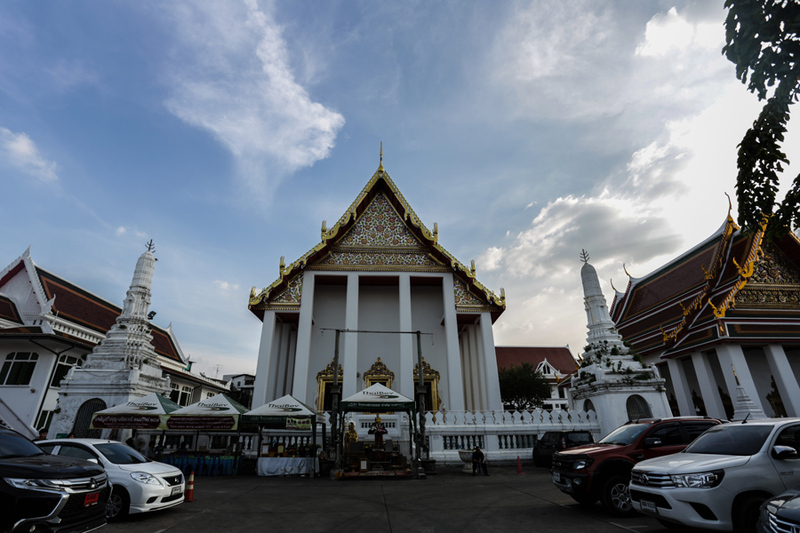 Important highlights of Wat Prayurawongsawat are…. 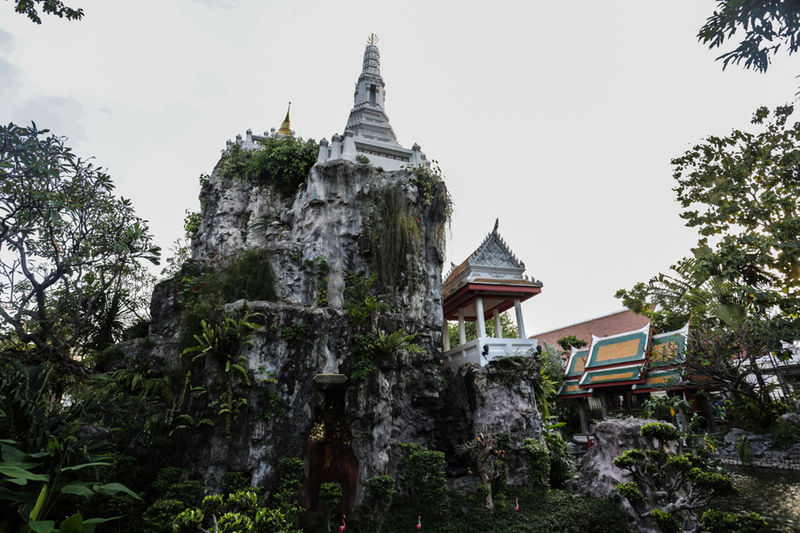 Sacred Heart Buddha Temple exemplifies Thai architectural work. At 16.99 meters wide and 20.19 meters long, its interior is split into 5 sanctuaries. Here cast Buddha images from the Sukhothai period are enshrined: an ancient image named “Naga Buddha,” is paired with “Phra Sri Sakyamuni,” which is also the principal Buddha image of Wat Suthat Thepwararam. 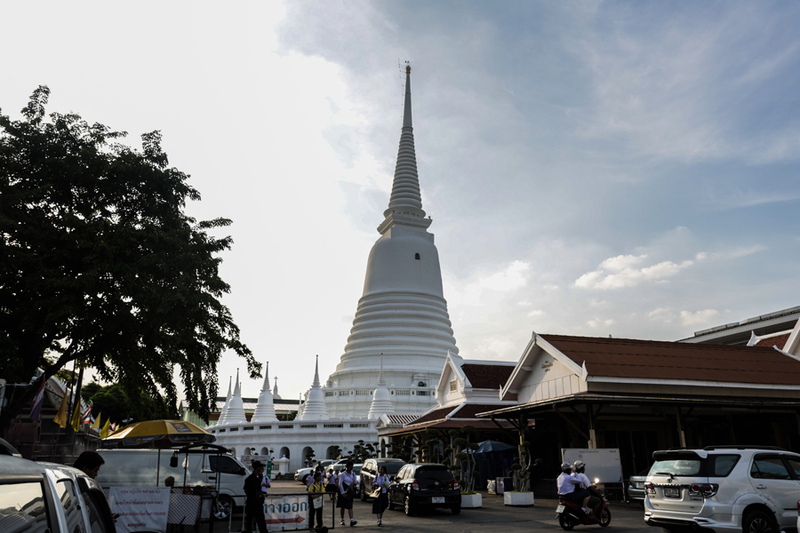 The Phra Borommathat Maha Chedi is 60.525 meters tall, with a base width of 162 meters and diameter of 50 meters. 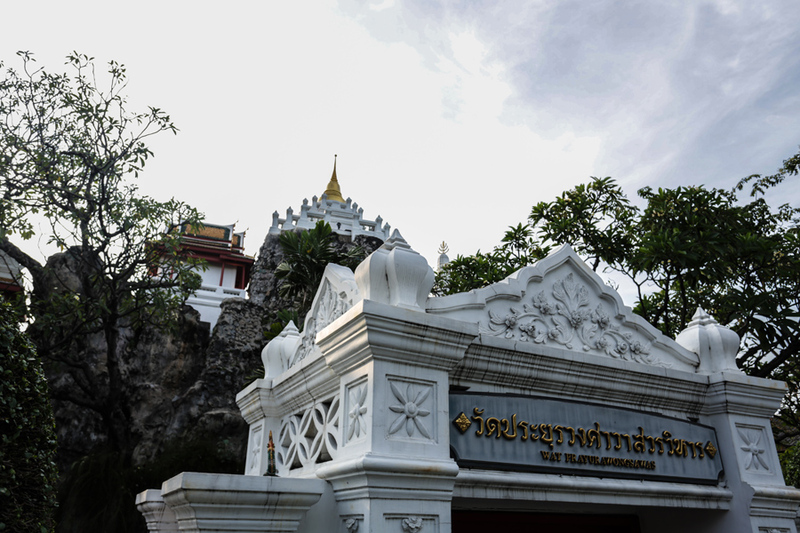 It was built by Dit Bunnag, completed during the reign of King Rama IV, and contains Buddha relics. 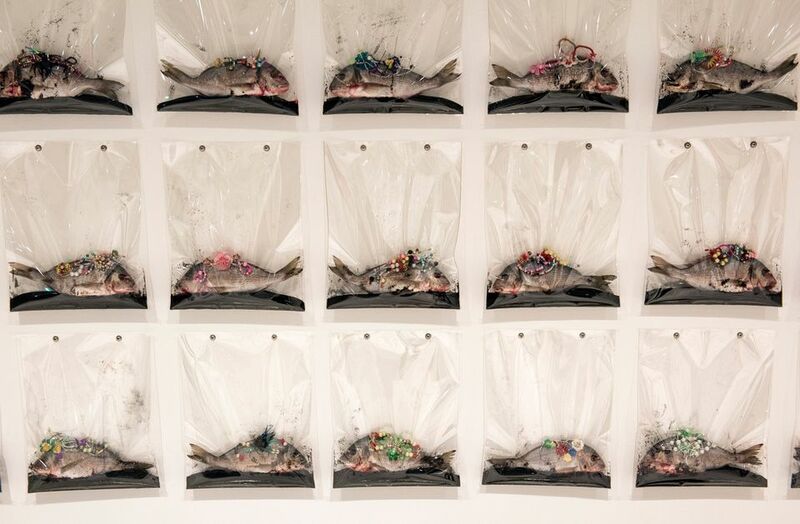 This artist has experience in the arts of sound and animation, so Chat…Naa (“the next life”) is a mixture of installation art, experimental animation, and experimental sound performance art, all touching closely on the roles of people, materials, the environment, and society. Zodiac Houses is a set of sculptures in black gothic style, full of astrological symbolism, that Montien has created as a search for peace, rebirth, and communication with the world after death. It was constructed in the Buddhism instruction hall of the temple so as to face the instructor’s lectern, suggestive of communication with the dead and the world after death. 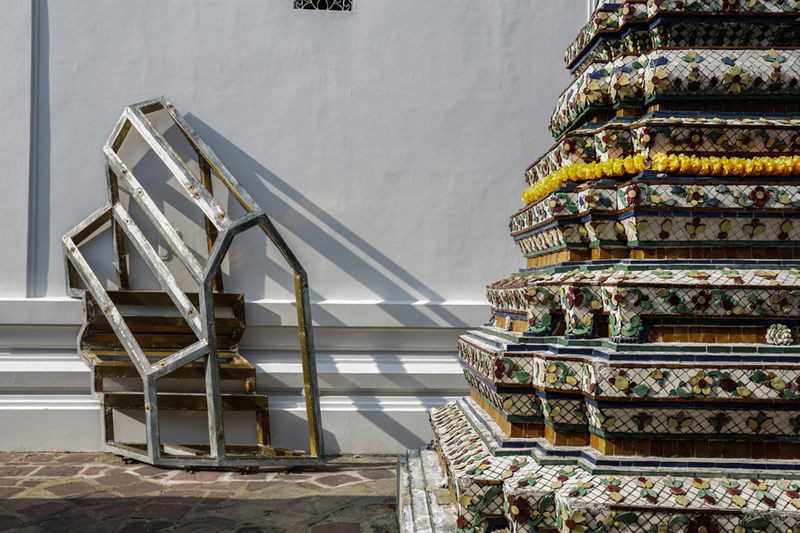 The installation art piece Sweet Boundary shown at Wat Prayurawongsawat has origins in historical research about the establishment of the temple and nearby areas. The iron fence here features a representation of sword, arrow, and spear. The actual fence was imported from England in the time of King Rama III in exchange for its equivalent weight in sugar. 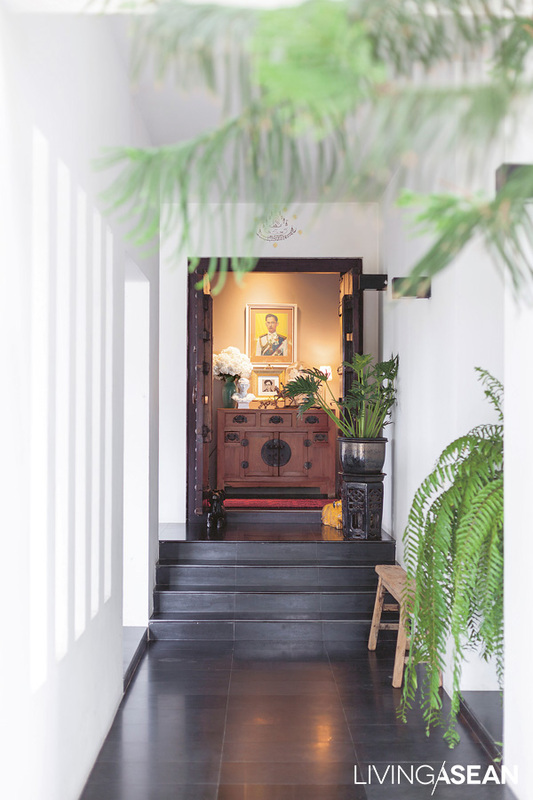 This piece harks back to the prime relationship between Thailand and China at a time when maritime trade could be held as a monopoly in the region; this was before the worldwide market glut in sugar and the arrival of Western nations on the scene. 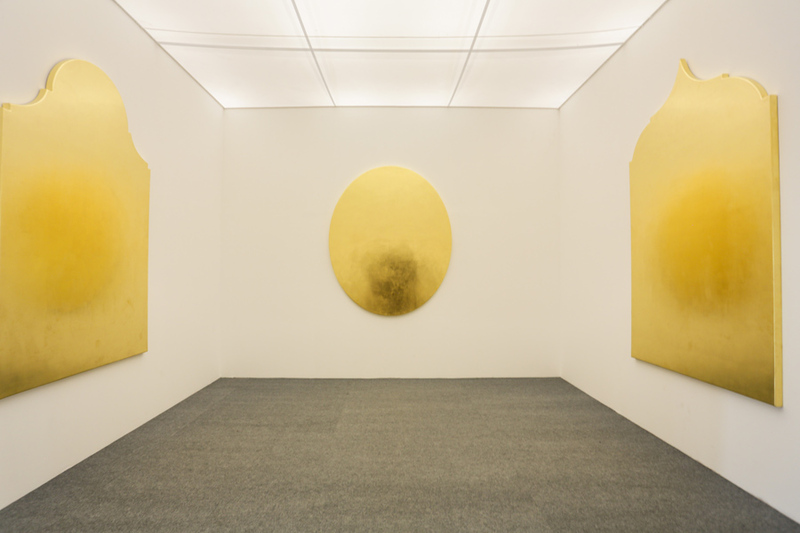 Monuments of the Memory, the Golden Room is a painting in shades of gold, but devoid of internal content, to symbolize sanctity, significance, memory, and prayer as they exist in both Buddhist and Christian religions. It is on display in the Temple’s religious instruction hall. 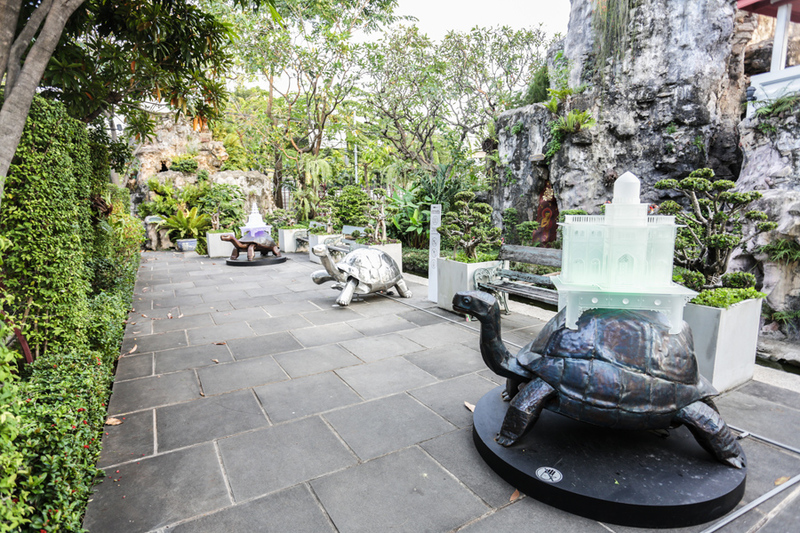 Turtle Religion is at Khao Mo, set by the pond, itself full of turtles and catfish. 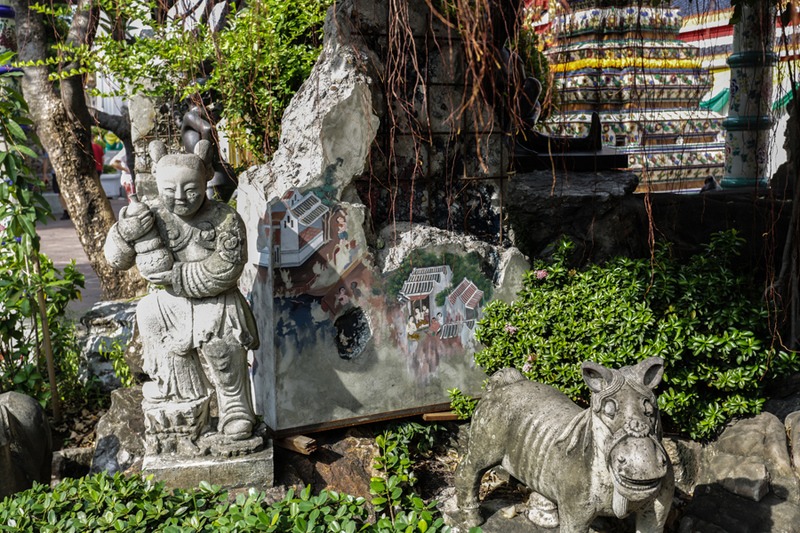 Here we find iron turtles carrying various objects on their backs that reflect the unity of religious beliefs and cultures which in the Khlong San area are so thoroughly mixed as to become one substance. 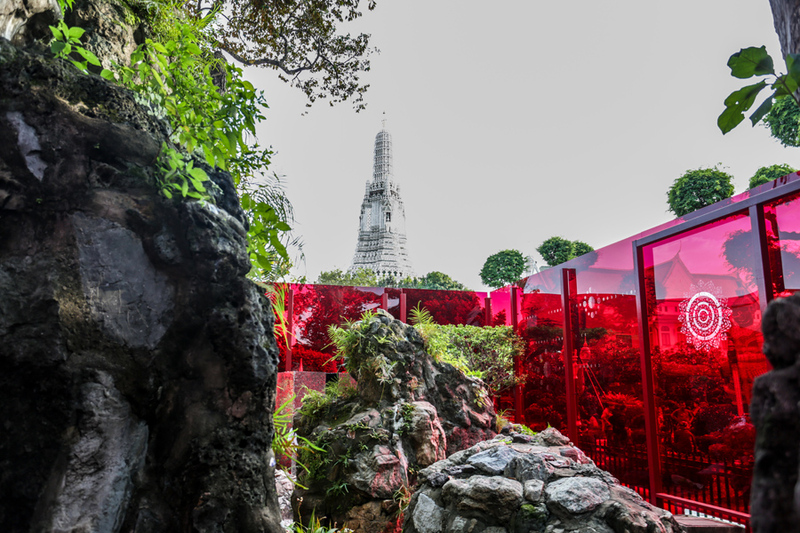 Altogether, including these three abovementioned temples, under the concept of “joyous, energetic art” the Bangkok Art Biennale 2018 International Festival of Contemporary Art has exhibits at 20 landmark location in Bangkok landmarks on display until February 3, 2019. Anyone coming to the City during this period will almost certainly see major art works by many world-class artists. 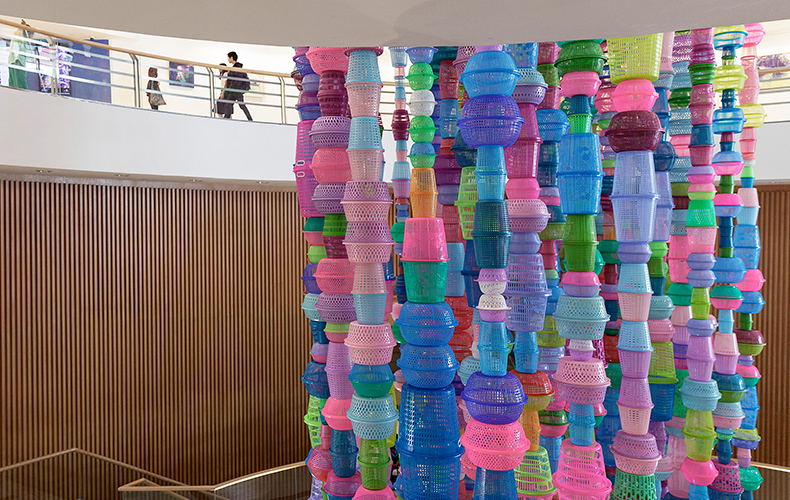 These are set up in shopping malls, along walkways, even in temples, as part of the contemporary international art festival Bangkok Art Biennale 2018. 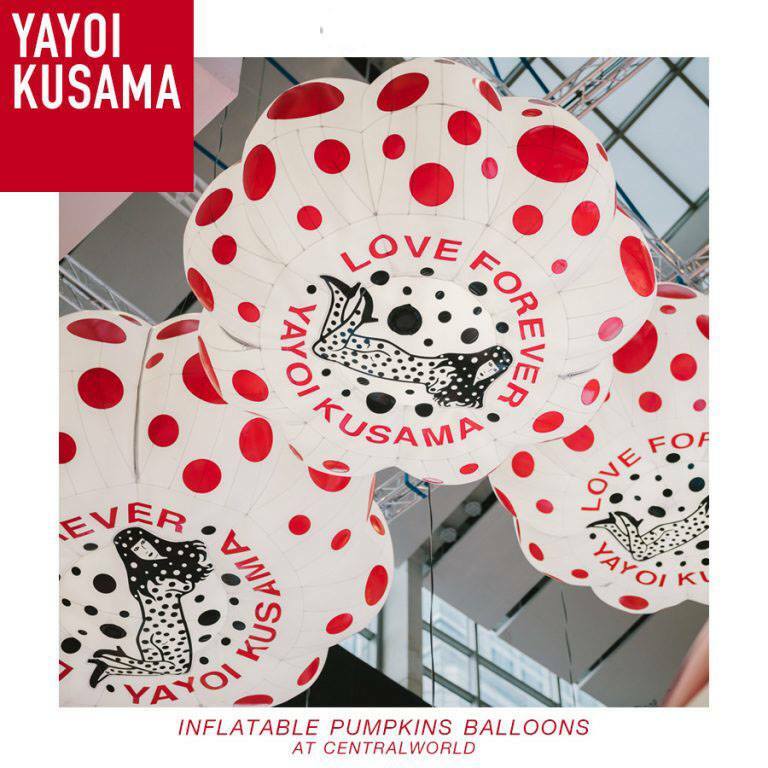 One of the artists we’ve been keeping close track of is Yayoi Kusama, known for artistic expression through repetition of polka dots on various materials and objects, some of them inspired by “Auntie Yayoi’s” frequent visual reflections on relationships that uses pumpkins as a medium, for example in the piece entitled Inflatable Pumpkins Balloons. 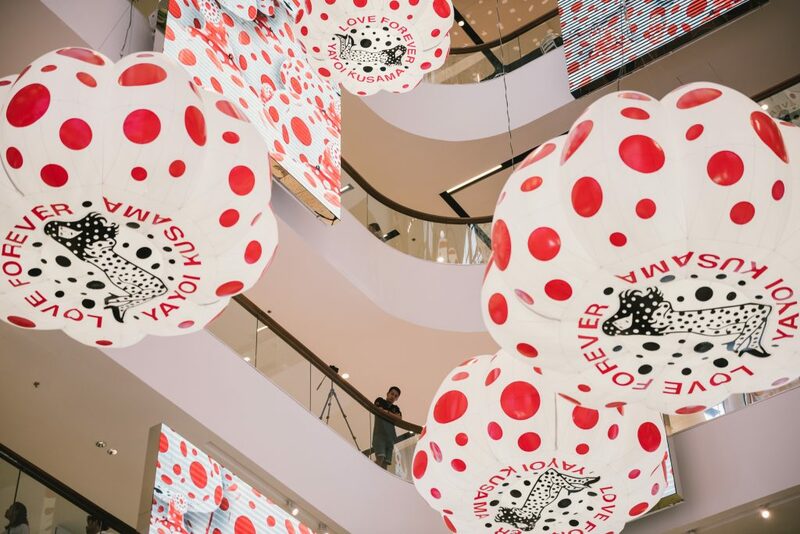 This gorgeous exhibition consists of 14 balloons suspended from the ceiling of Central World, hanging chandelier-like above a wide area also adorned with those signature red dots. When the project was transported from Japan it was still in an unfinished state, but on arrival at Central world it was swarmed by both a Japanese and a Thai work team speeding to complete all the details, not in just the one or two days we were there watching, but over a period of many days. The subtleties of the Japanese, insisting on perfection in every detail, allowed not the smallest imperfection. Those floating balloons weren’t simply inflated and hung up: light wiring had to be strung through an elaborate framework constructed of beams and internal supports. It took all that and more to produce these beautiful airborne pieces we know as Inflatable Pumpkins Balloons. Why does it have to be Pumpkins? The pumpkin shape has been a staple of her artistic work dating back to the 1950’s: she’s always been attracted to materials whose natural forms had an unevenness to them and also showed repetitive patterns. Adding to her unique view is a neurological condition that has caused her to have double vision since age 10, and has actually contributed to her producing such world-class artistic work. 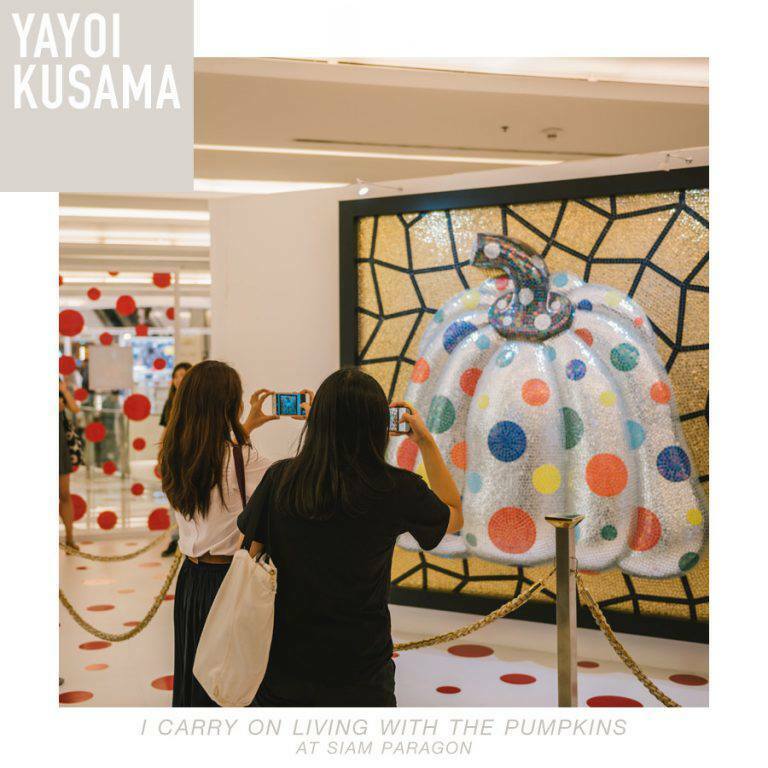 Another spot everyone can see Yayoi Kusama’s Work is Fashion Gallery 3, on the 1st Floor of Siam Paragon: I Carry On Living With The Pumpkins (Silver Pumpkin and Red Pumpkin) gives us a pair of Auntie Yayoi’s signature pumpkin works. 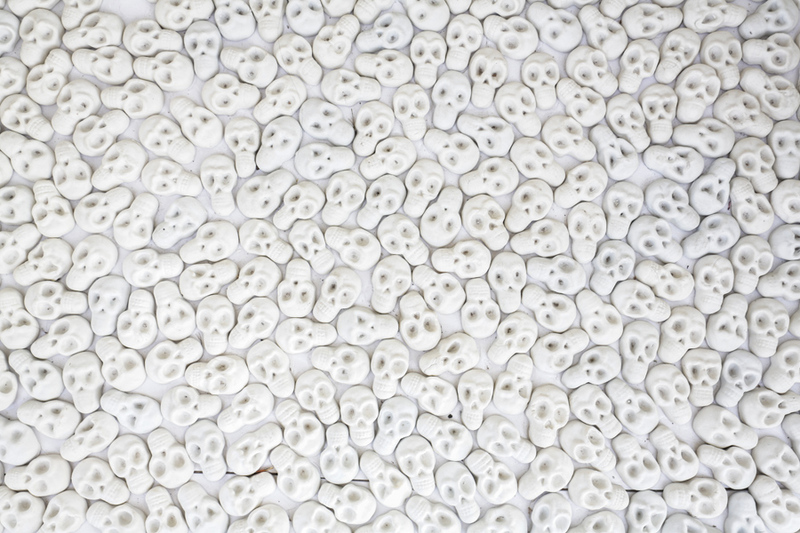 One of the sculptures features silver dots in subtly detailed mosaic patterns reflecting various things hidden in them. Another, in the same area, is a red pumpkin with black polka dots which we’re able to view up close. On its installation date it appeared to involve just a simple setup of 2 ordinary pieces of art, but the actual story is a bit more complex. Due to the size and great weight of the works, plus the fact that there were no easy protuberances to grab onto, bringing them through the doors with both pieces remaining in perfect condition was a huge challenge to pull it off, and in the end it took from nighttime till the break of dawn to do it successfully. What a strange experience! Art exhibitions aren’t always an easy business, right? Well, so many people have put in so much great work, it would be a pity if not enough folks saw it . . . so what are you waiting for? Get down here! We have less than a month before the curtain falls. 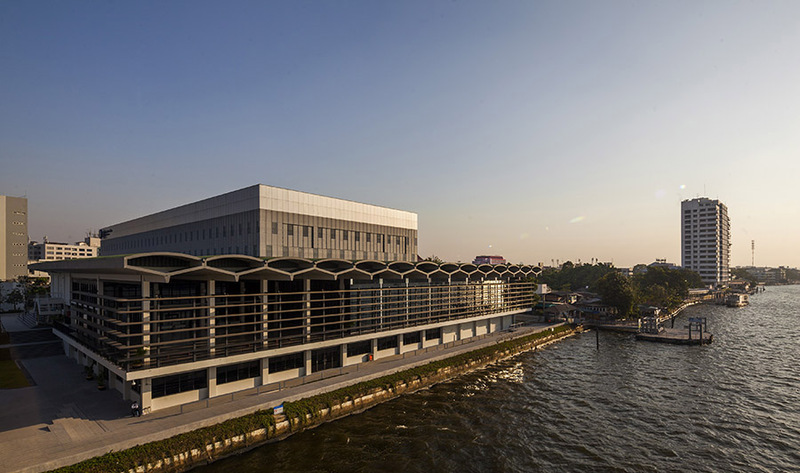 The inaugural Bangkok Art Biennale will end on February 3, 2019. If you haven’t already been to the show, find time to do it. Plenty of exciting exhibits to see, if you love art. Grab a smartphone. Bring your friend, and take a selfie or two. Not sure where to start? 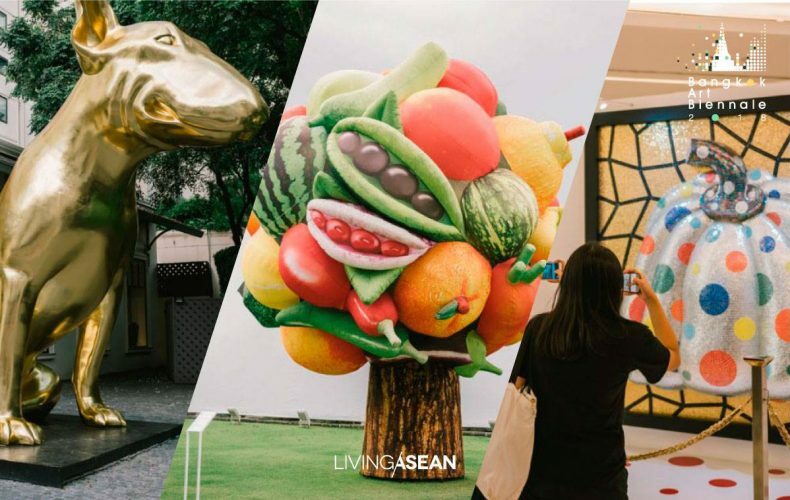 Living ASEAN recommends 3 destinations that you can’t miss. 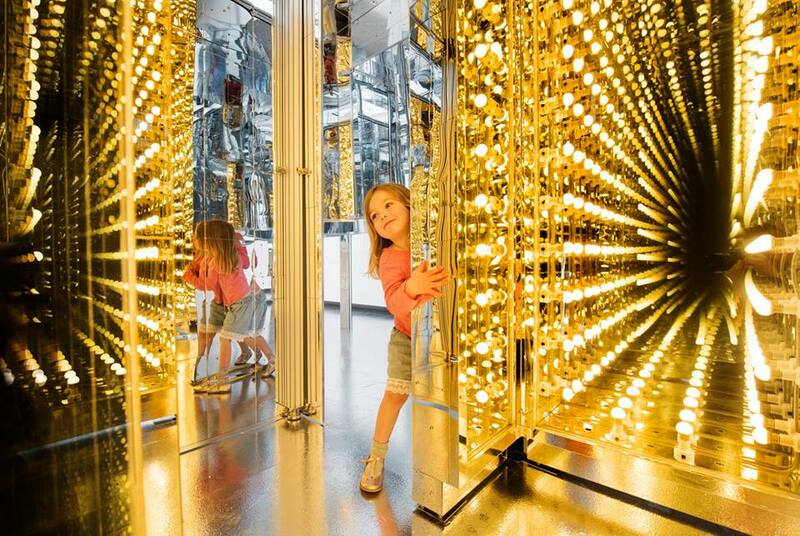 You will love these amazing exhibits. BAAC is one of 20 destinations partaking in the country’s inaugural art festival. It’s centrally located and accessible via BTS mass transit. Get off at National Stadium Station. Many world-renowned artists are exhibited here. Worth a visit, worth a lifetime. To get there: Take the BTS. Get off at National Stadium Station. It’s easy to get to: Hop the BTS at National Stadium Station. Get off at Taksin Bridge Station. Then catch Bus No. 1 or No. 75 to Charoen Krung Soi 40. 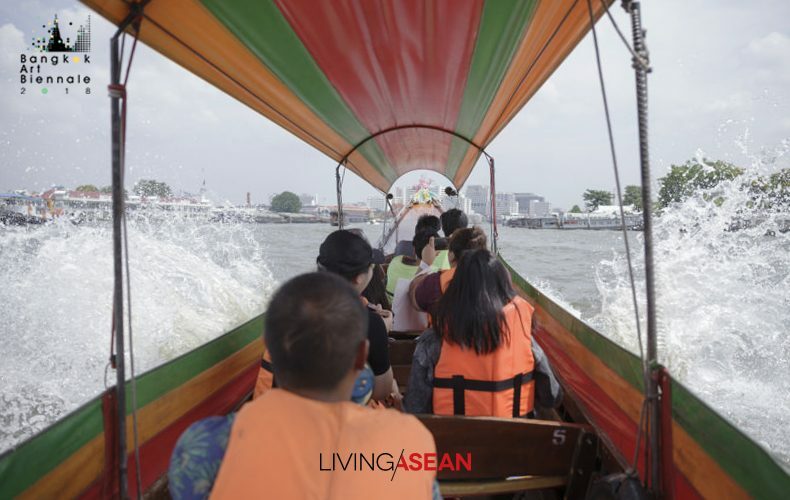 – Take a Chao Phraya River Boat (regular service), and get off at Wat Sam Phraya – Or take the Chao Phraya River Express, and get off at Theves. – Take No. 3, 9, 30, 32, 33, 43, 49, 53, 64, 65, 516 and 524. And get off at Wat Sam Phraya. 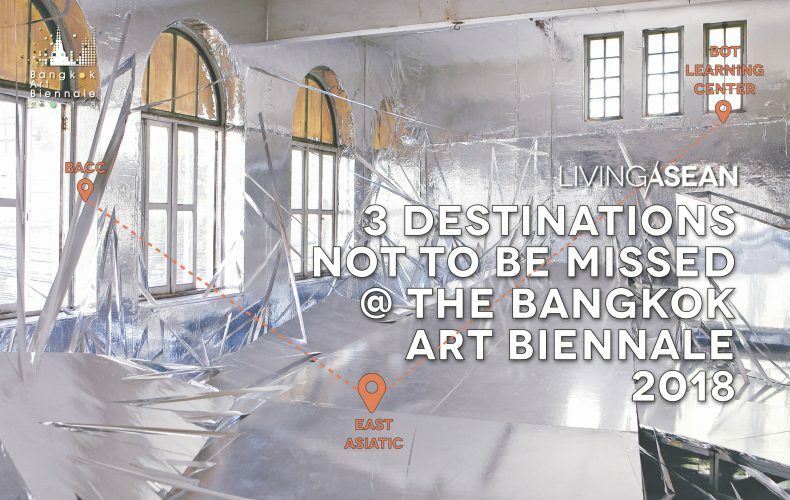 Listed above are 3 out of 20 venues of the Bangkok Art Biennale 2018. 200 works by 75 renowned artists from 34 countries are on display. The BACC has the most shows. Plenty of happenings to excite your imagination. You can see all in one day if you start early. But, time is running out. We don’t want you to miss any of them! Don’t prejudge beauty: just look deep, seek the true inspiration at the center of a single art work, a particular piece that gives an extraordinary reflection of society, ideas, and culture, or perhaps may take you straight down into the depths of the human soul. 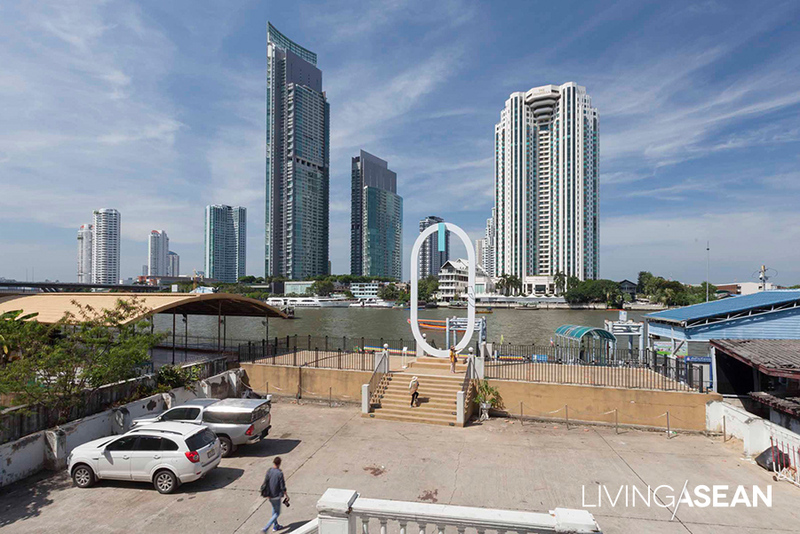 If you have time, we hope you’ll use some of it each day visiting the Bangkok Biennale 2018 Art Festival, with exhibitions in urban settings and along the Chao Phraya riverside. Here we’re calling your attention to six artists whose work you should experience for guaranteed insights into the world we live in. 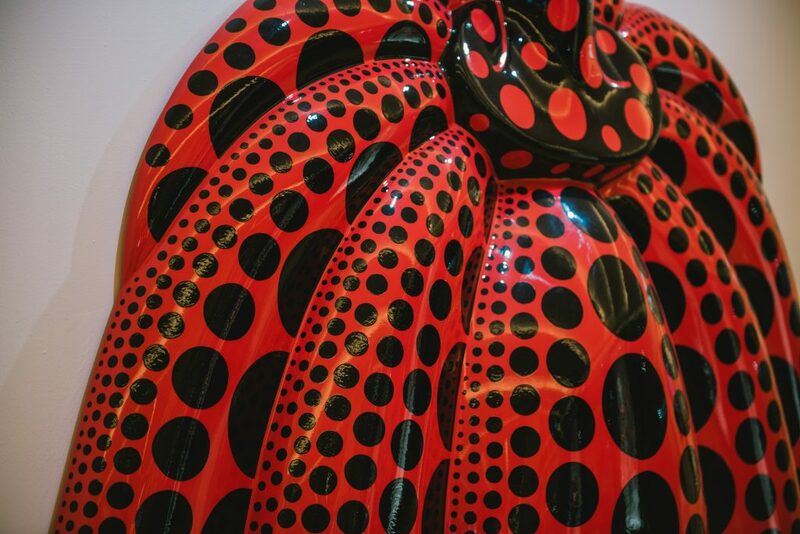 Let’s start with “Auntie Polka Dot,” Yayoi Kusama, famous for her characteristic repetitive use of those quirky dots on all sorts of artistic media. Some of the beauty in Auntie Yayoi’s work comes out of her reflections on struggles for gender equality and women’s rights. 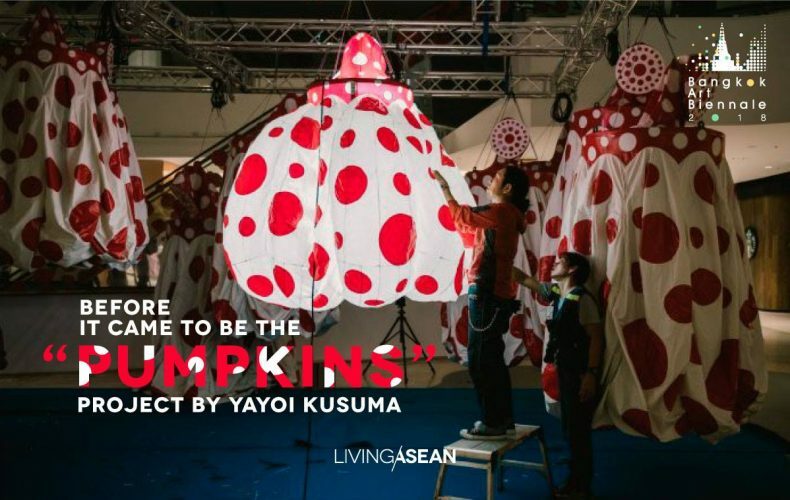 She uses netting, pumpkins, and mirrors to show relationships, as you’ll see in the piece named Inflatable Pumpkins Balloons on display at Central World. There you’ll see 14 pumpkin-shaped balloons suspended, chandelier-like, from the ceiling, in an environment dominated by red polka dots. Everyone asks this question! In a Louisiana Channel interview, Auntie Yayoi answered, “I love pumpkins because of their funny shapes, sometimes even quite like human facial features, and they give me a warm feeling.” And the pumpkin shape has been a staple of her art since she her youth in the 1950’s: she’s always been attracted to materials whose natural forms had an unevenness to them, as well as showing repetitive patterns. Adding to her perception has been a neurological condition causing her to have double vision since age 10, which has actually contributed to her producing such world-class artistic work. Watching the dedicated performance of Auntie Yayoi’s Japanese work team, we were amazed at how no tiny detail escaped them. This involved not only inflating and hanging the colorful balloons, but creation of beams and internal supports, and stringing wiring, finally resulting in the spectacle of gorgeous pumpkins floating high above which you can see today. 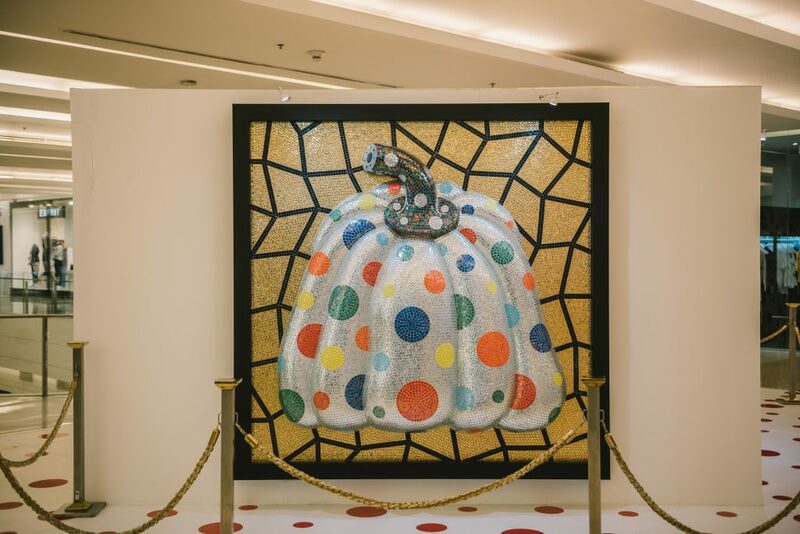 Another two of Auntie Yayoi’s signature pumpkin works are on display at Siam Paragon, one a sculpture featuring silver dots in subtly detailed mosaic patterns reflecting various things hidden in them, and the other in the same area, a red pumpkin with black polka dots, called I Carry On Living With The Pumpkins, both definitely worth close-up observation. This title translates word for word between language, no room for misunderstanding. If you’re an animal lover and see a lost dog poster, what’s your first reaction? Naturally we feel sorry for both dog and owner and want them to find each other quickly. But more than that, imagine yourself in the dog’s place: scared, anxious, unfamiliar with everything. 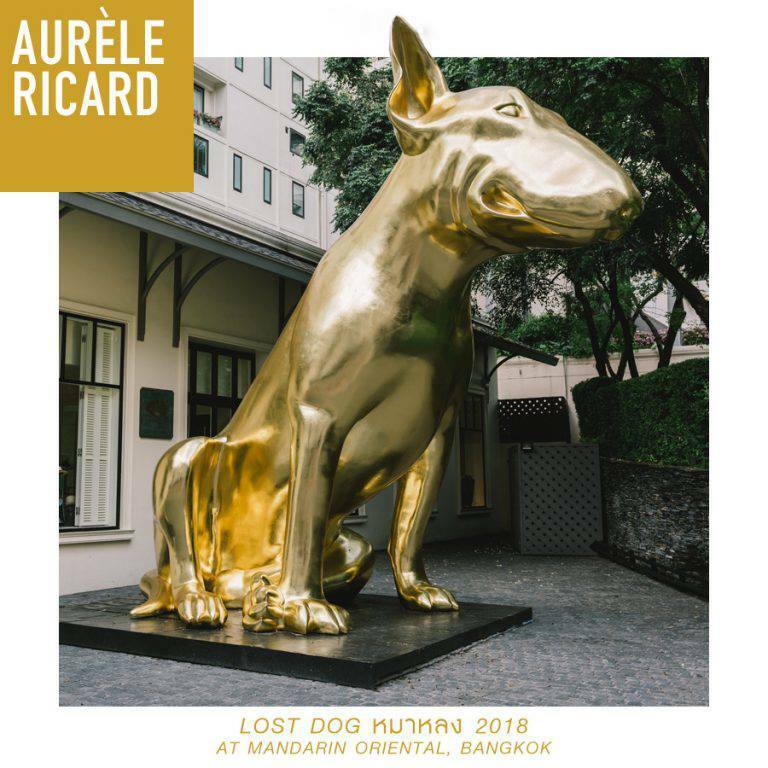 Aurèle Ricard’s Lost Dog may represent a person living in modern society, trying to find a path home in the confusion of today’s world. And Lost Dog is a reflection of life not only under problematic social conditions, but also afflicted by the continuous environmental deterioration and decay caused by limitless and increasing human consumption. Lost Dog CO2 is a huge 3.8-meter tall dog sculpture made entirely from more than 1500 plants, mainly ferns and climbing vines, vegetation helping to reduce air pollutants. We are the lost dog’s owners: human beings who suffer from the pollution and confusion of the city. Although lost and stumbling around in the dark, by starting with ourselves we should be able to change the world, developing towards a good future for the young and the next generations. Driving, come just a little further down the road to Central Embassy for more Choi and more large pieces. Robot is a black, awesomely scary giant and The Joker is a huge golden crown that looks as if it’s been dropped there. We don’t know if there’s any relationship between these two, but it’s fun to strain the brain coming up with one. The black robot god can get up and lie back down as if fatigued from work. What’s he been up to? Use your imagination. Marina Abramović’s fascinating performance art, revealing intention through an interplay of the human body and spirit, is at the core of all the works that made her famous, one of which is Rhythm 10 (1973). Rhythm 10, her first solo performance, features knife play. Spreading her hand wide, she slams the points of the knives (there are 20 of them!) rapidly in each in-between space, all the time recording the sounds. Then she plays the recording and repeats the process in synch with the recorded rhythm. Spooky, no? Marina says she’s neither crazy nor has a death wish. Even if many of her works appear life-threatening, she is simply testing the extent of the body’s powers. She’s discovered it isn’t so much the body, but the mind that enables us to go beyond our limitations. For her, performing before an audience merely means pushing her own limits to be able to do things normally impossible. 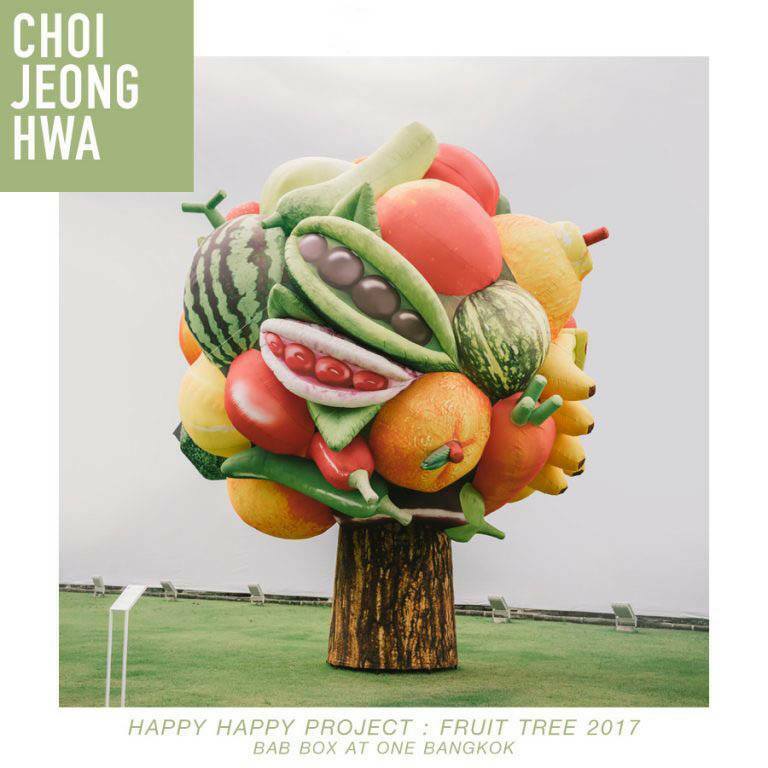 The works she has brought to Bangkok Art Biennale 2018 are retrospectives of her installation art. Visitors to Standing Structures for Human Use (2017) participate in activities by responding to the structures. A person stands on one side and communicates with another through a crystal. Marina believes that if our minds are still enough, they can send energy to each other. 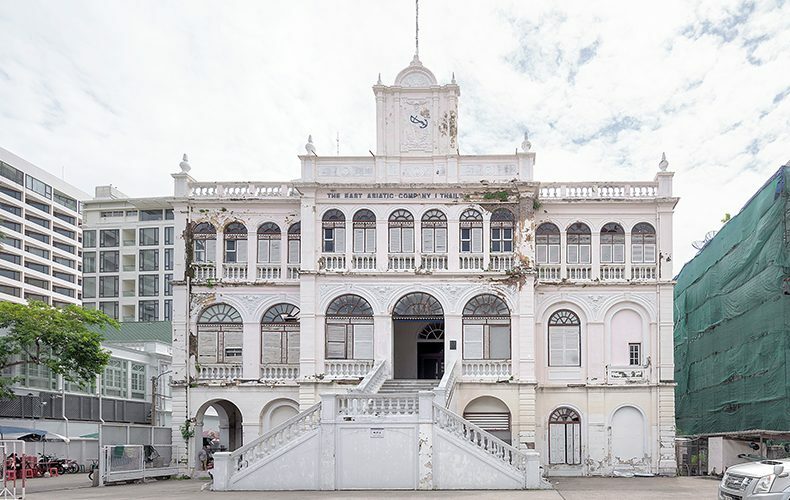 Lee Bul’s BAB festival works are found in the East Asiatic building, a splendid example of Renaissance revival architecture. This makes for a perfect blend of history and fascination. Wood is valuable in all its forms; a tree has value, whether standing, cut into many forms, or even as wood chips, to get every possible use from it. 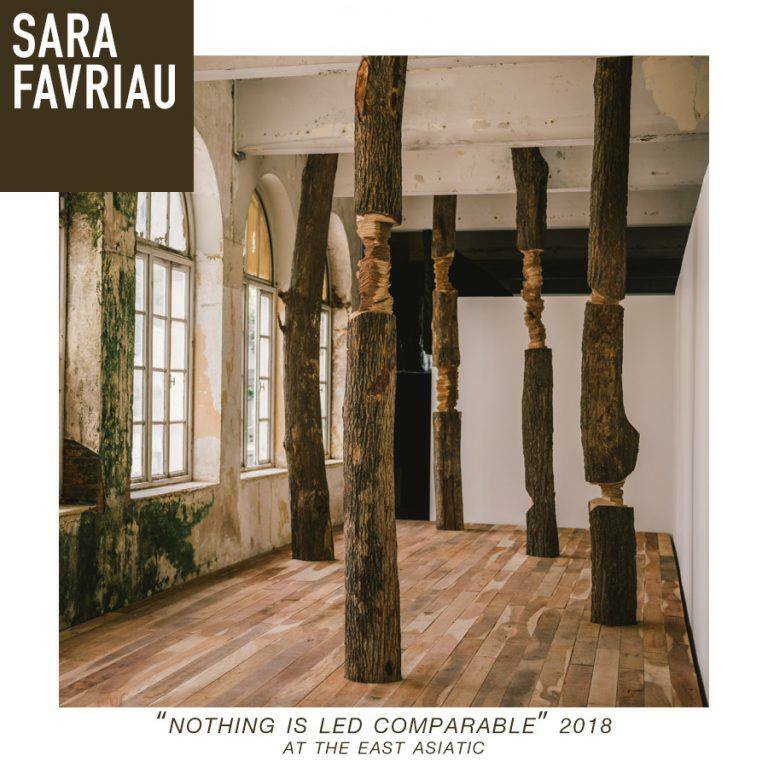 Nothing Is Less Comparable 2018 is the name of a sculpture work by French artist Sara Favriau. 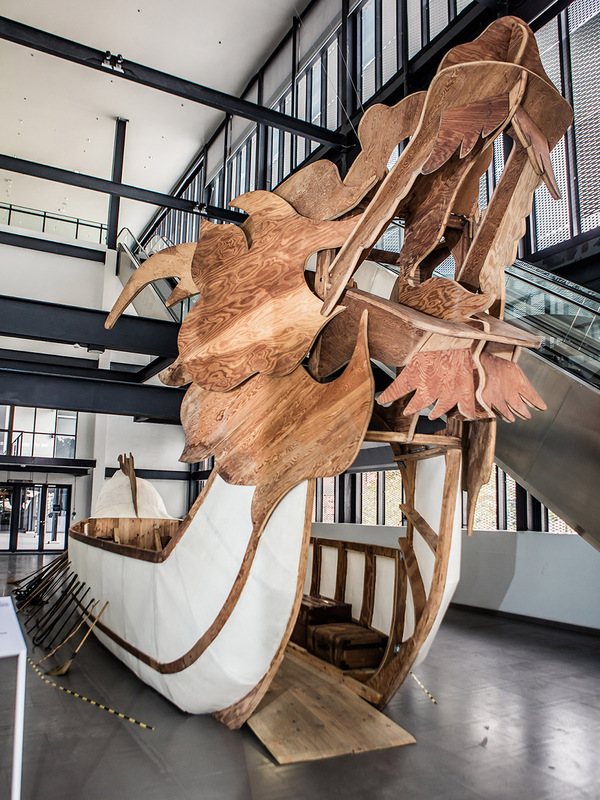 Her remarkable strategies create installation art from teak, tembusu, and sandalwood to communicate a colonial flavor that reflects the exhibition building itself. 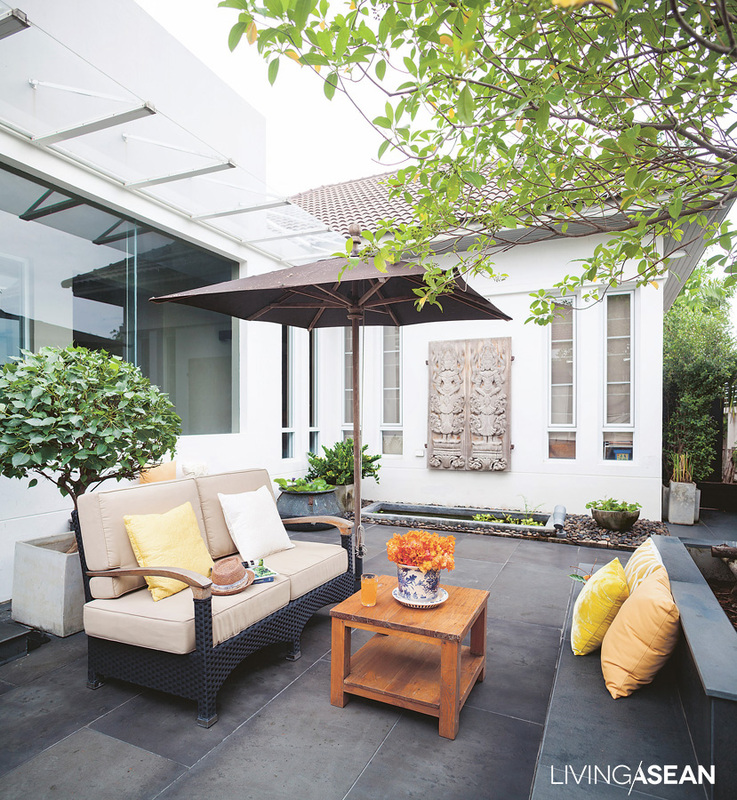 But for the vision she brings to Bangkok, and how she makes use of wood materials in the tropics . . . ah, but yes! You must see this for yourself! 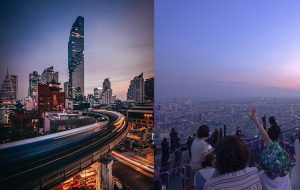 Beyond the 6 artists we’ve mentioned here, Bangkok Art Biennale 2018 offers countless works from many you have likely never seen, in a great number of locations across the city and along the river. The festival runs from October 19, 2018 through February 3, 2019 at 20 Bangkok venues. 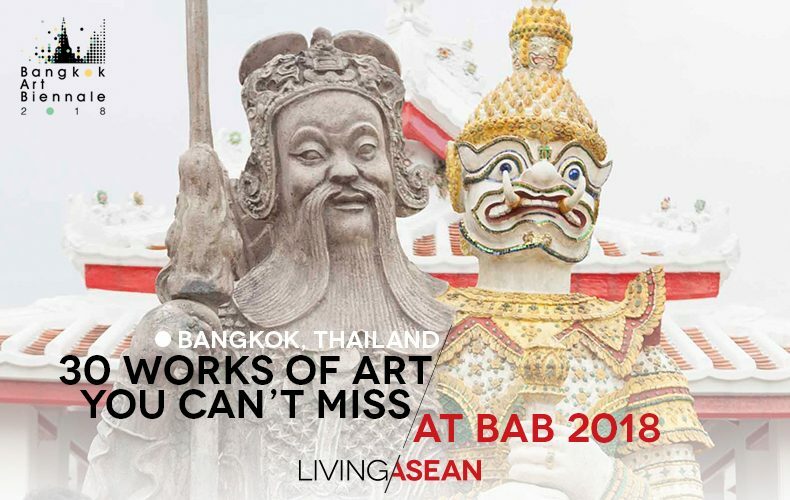 The art of the ASEAN is shining with excitement at the Bangkok Art Biennale 2018. 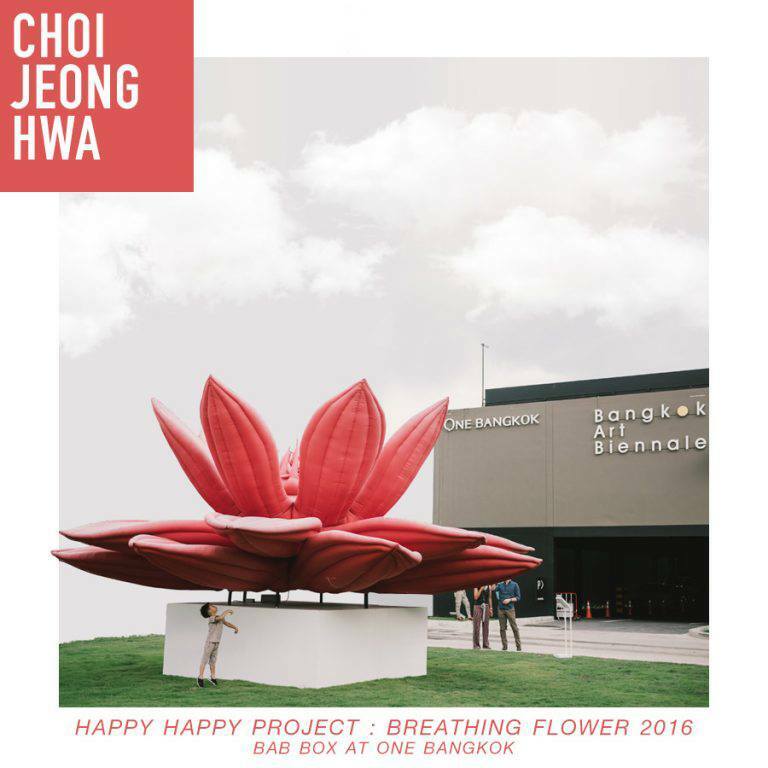 Besides encouraging creative thinking through their works, artists from around the Region see their expressions as a tool to communicate their enthusiasm, raise their concerns, and get people to think about various social and environmental issues. Their thought-provoking visuals and other artistic designs reflect how art is playing a vital role within the community much like social media is used to connect with people and foster new ideas. 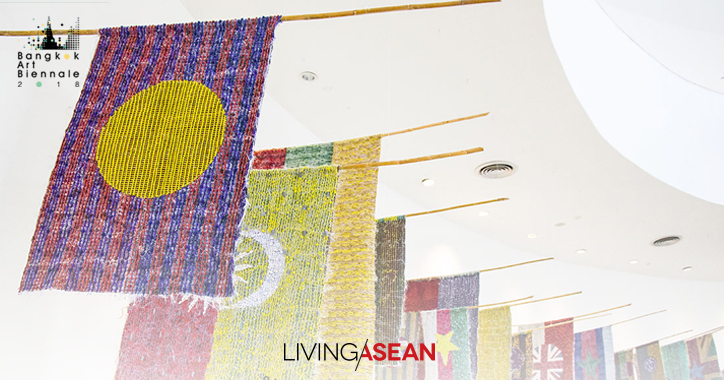 Our Living ASEAN team has explored the works of visual art on display and filed this report. Check it out! The Association of Southeast Asian Nations, ASEAN for short, is a regional organization committed to promoting cooperation and facilitating economic and sociocultural integration among its ten member states, which include Myanmar, Thailand, Cambodia, Laos, Vietnam, Brunei, Malaysia, Singapore, the Philippines, and Indonesia. The ASEAN population is estimated at 635 million. Lim Sokchanlina is a photographer and founder of the artist group “Stiev Selepak” that’s known for works in various disciplines ranging from photography to installation to performance art. His expressions often reflect with gloominess on socio-economic conditions in Cambodia. 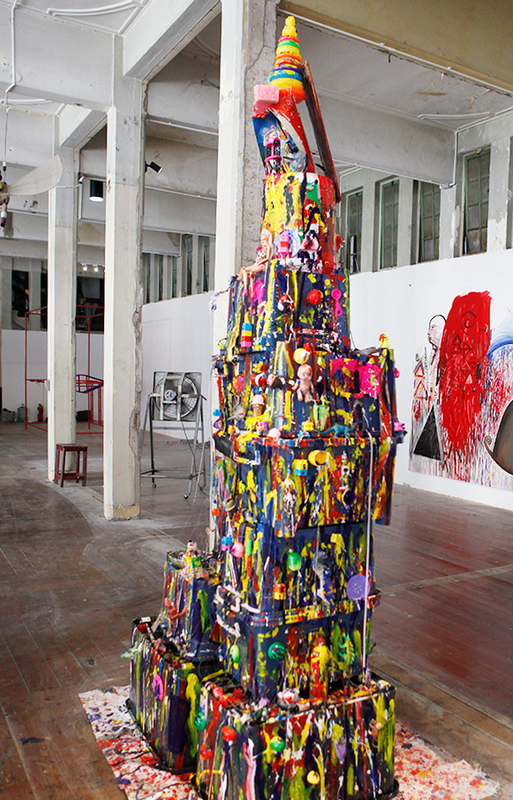 Worthy of attention is the work of visual art titled “Sa Sa Bassac Art Project”, which he recently exhibited at the Sydney Biennial, Australia. He also debuted his latest work titled “Sunshower: Contemporary Art from Southeast Asia from the 1980s to Now” at the Mori Art Museum in Tokyo in 2017. “National Road No. 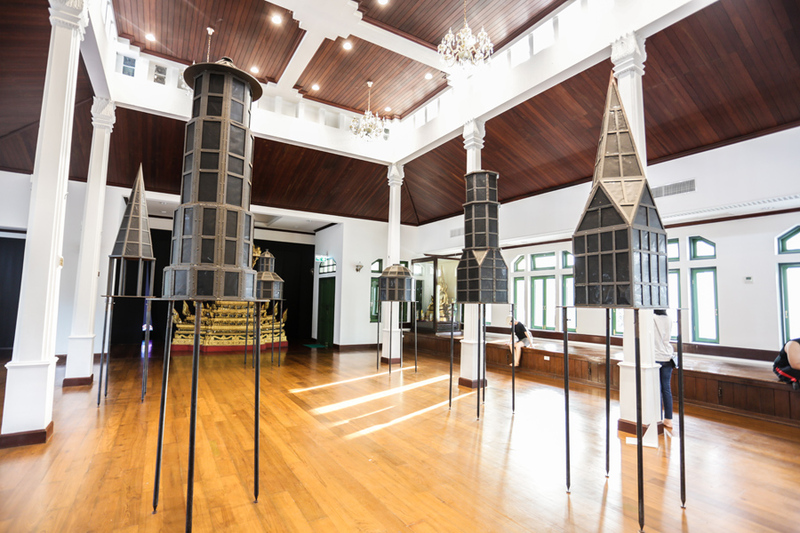 5”, his exhibit at the Bangkok Art Biennale 2018, tells stories of overwhelming distress after people’s homes have been torn down to make room for the development of a project along the Thai-Cambodian border. Timber that’s eroded by being exposed to the weather tells an unforgettable tale of heartbreak after people’s lives have been altered by the expansion process of a capitalist economy. 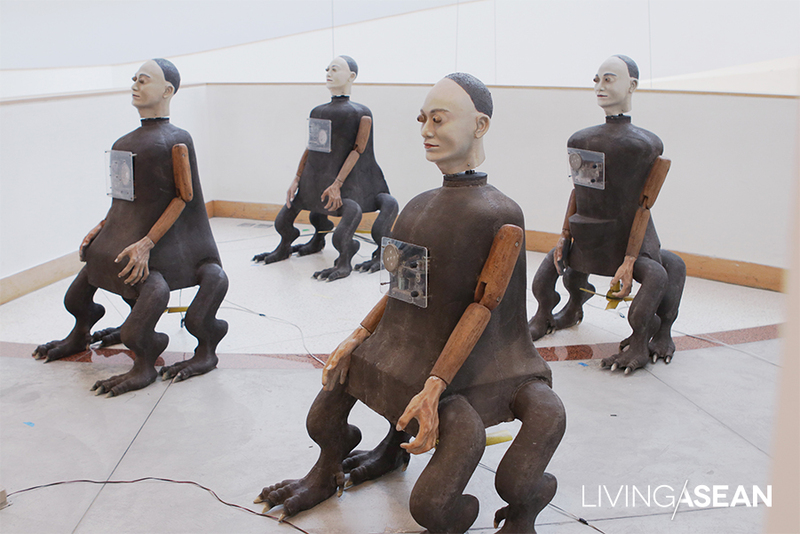 A sculptural installation titled “Rekayasa Genetika” (REGEN) by Heri Dono. 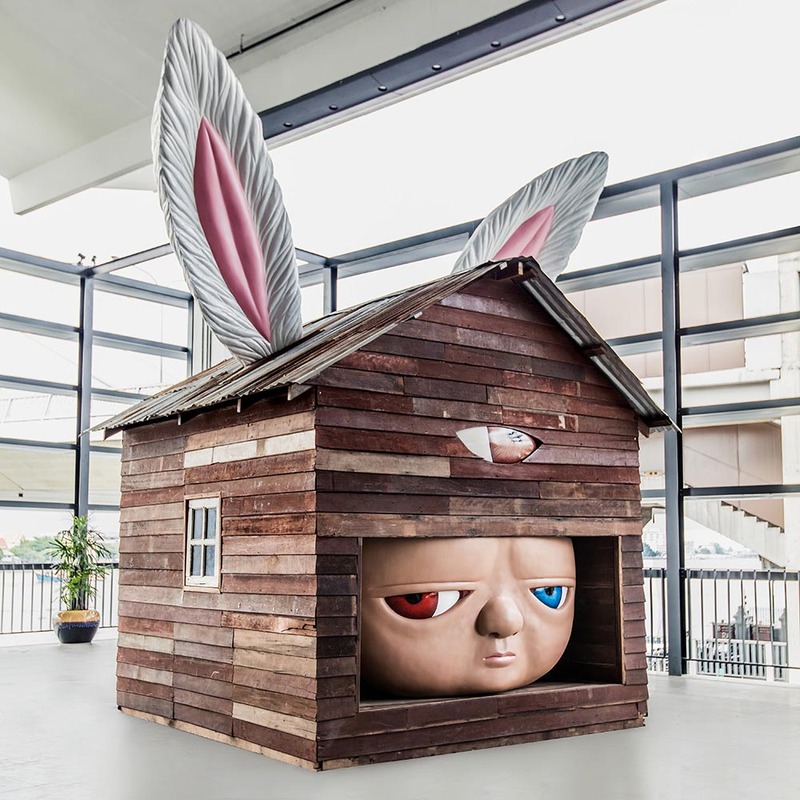 “Rekayasa Genetika” (REGEN) is sculptural installation by Indonesian artist Heri Dono. Surprising in a way that’s unique to his artistic ability, the exhibit is appreciated for its beauty of non-verbal expression and strong emotional power. The human like sculptures showing the effect of mutation get their inspiration from Indonesia’s shadow puppetry known as Wayang. The sculptural works are made of a variety of objets trouves ranging from fiberglass and wood to electronic gadgets and electric fans. 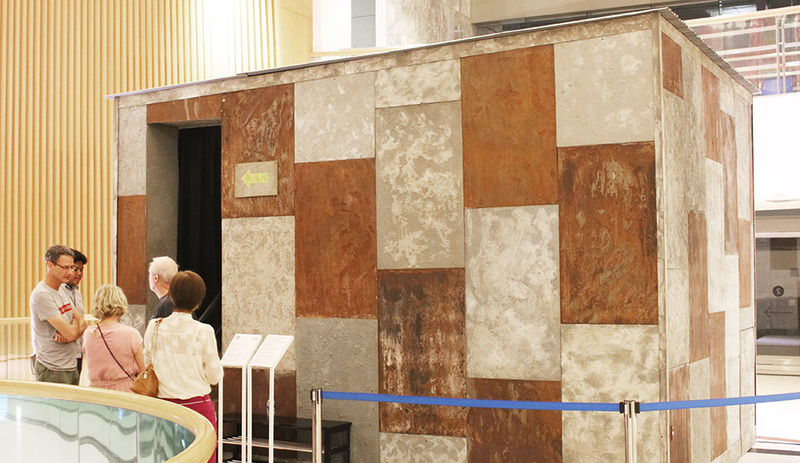 Art lovers can interact with the exhibits by pressing the button provided. 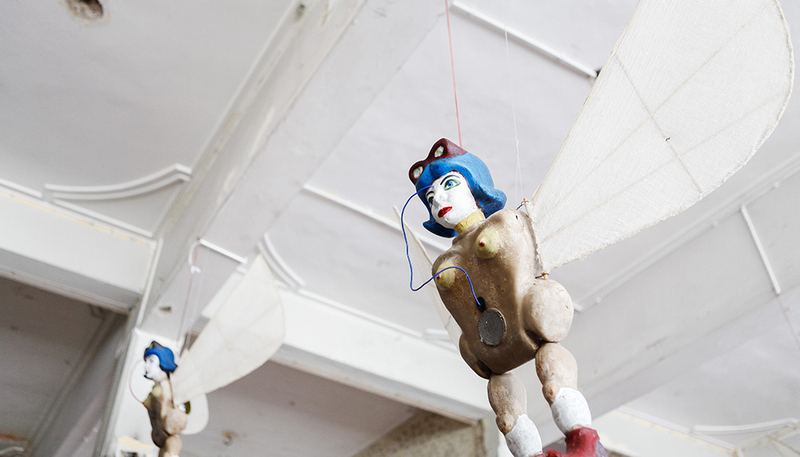 Besides the mutants, Heri also debuts “Flying Angels” at the East Asiatic Building for the duration of Bangkok Art Biennale 2018. 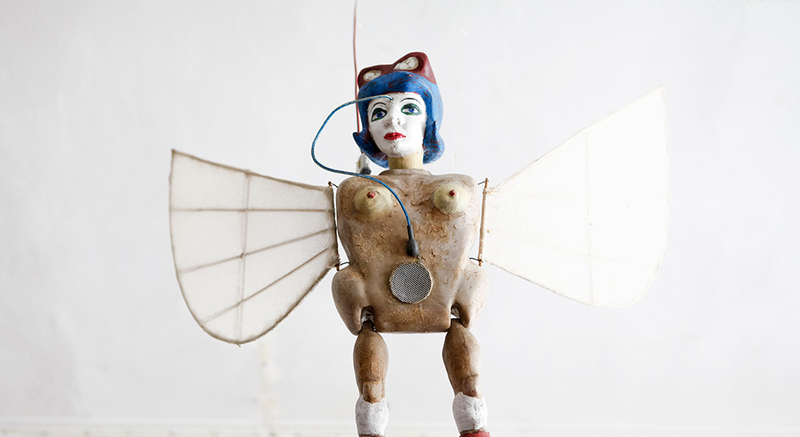 Meantime, another squadron of “Flying Angels” are on view at the Hotel Peninsula Bangkok. The Check Point by Myanmar artist Nge Lay sends a tactful reminder that says, “Everyone must come through that door.” It reflects a situation in which people experience a clash of opposing needs or wishes in daily living. 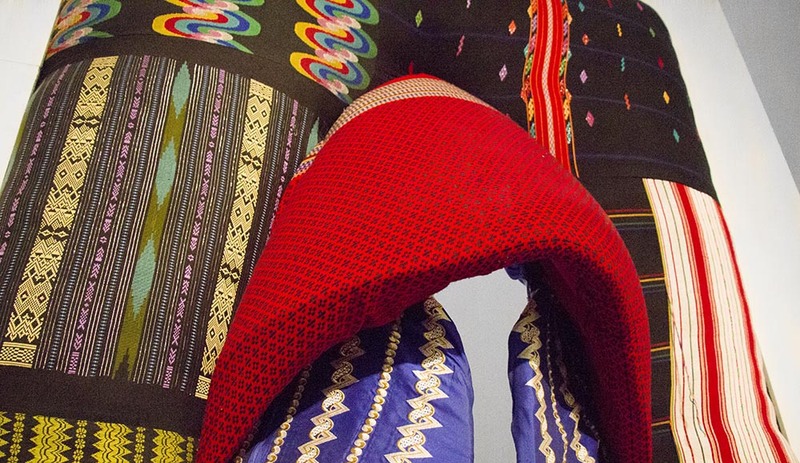 A graduate of the Yangon University of Culture, the artist pursued a career in ornaments and accessories design until 2003 when she made the switch to live performance art and photography. Her works of visual art oftentimes touch on the perception of social and historical circumstances and the prospects of Myanmar’s politics. 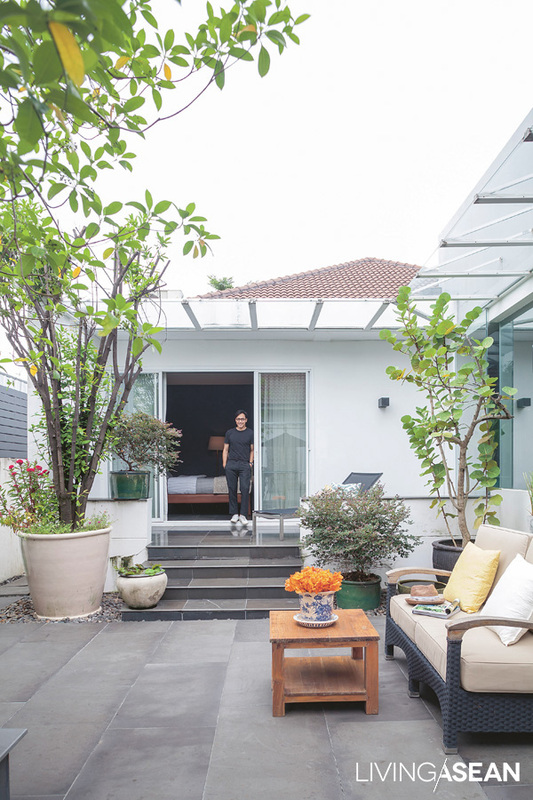 Since 2009, she has exhibited at various art scenes including the Singapore Biennale 2013 and the 8th Asia-Pacific Triennial of Contemporary Art. Justiniani is among the artists who took part in social movements in the Philippines from the 1980s to the 1990s. Through the years he has earned affection and esteem for contributing to positive change. He won the Thirteen Artists Award from the Cultural Center of the Philippines in 1994. Since then, he has exhibited at major art events worldwide, among them the Asia-Pacific Triennial, the Yokohama Triennial, the Asia Society in New York, the Asian Art Museum in San Francisco, and the National Art Gallery of Singapore. Title: We die if we don’t dream. 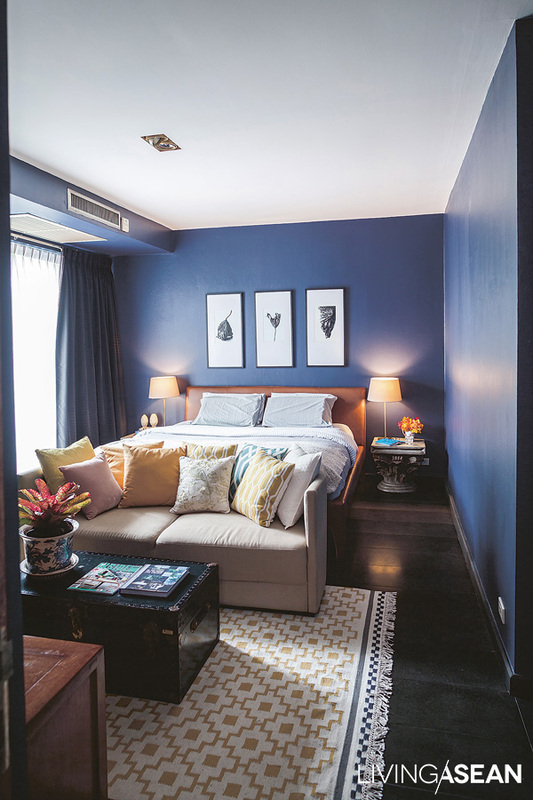 Winner of the 2010 ICON de Martell Cordon Bleu Photography Award, Malaysian artist Sherman Ong has worked in motion pictures and photography in Singapore. She is passionate about the circumstances affecting the relationships between humans and the environment as well as change that’s taking place in modern-day Southeast Asia. Sherman is widely known for her work titled “NUSANTARA: The seas will sing and the wind will carry us” that chronicles long journeys by sea through the Region from past to present. It tells stories in a non-verbal way of movement of people from one area to another as well as cultural assimilation that has come to characterize the social landscape. Over time, as people came in contact with one another, the individuals or groups of different ethnic heritage are absorbed into and become a part of the culture of a society. 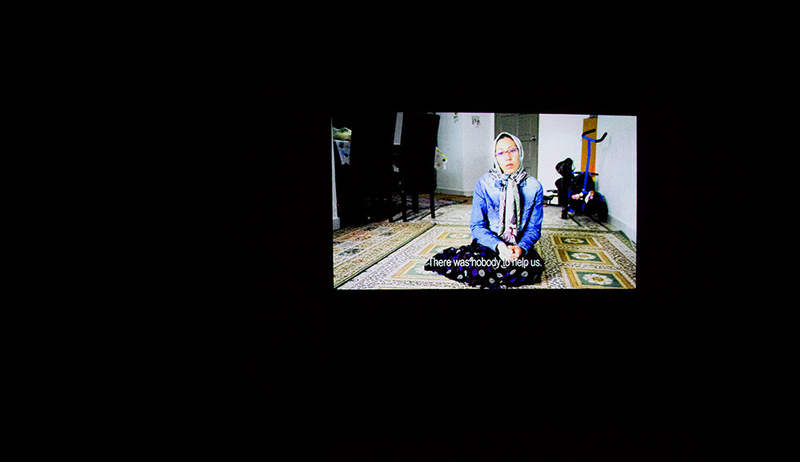 For the Bangkok Art Biennale, Sherman Ong debuts “We die if we don’t dream” (2018), a thought provoking exhibit about the experience, ideas, and memories of Afghan people in Malaysia. “The Adventure of Sinxay” is a full-size wall painting in vivacious colors by the Thai-Lao group Hooptam. The painted picture is the result of a confluence of ideas between Songwit Pimpakun, Tanupon En-on, Home-Sawan Umansap of Thailand and two artists from the Lao PDR Tiane Vilayphonechith and Amphonesouk Phaysourine. The amazing work of visual art gets its inspiration from oral literary works about the basic goodness of mankind and courageous character. It tells a story in a powerfully irresistible way about a young man who goes on a long journey to rescue his relative abducted by a giant. Along the way, the story of imaginary persons and events makes reference to the basic teachings of the Buddha, the beliefs associated with the local people, and the mottos that guide them through pain and suffering. For the Bangkok Art Biennale 2018, the artist group gives a different interpretation to the classic story so as to fit in with modern-day circumstances. 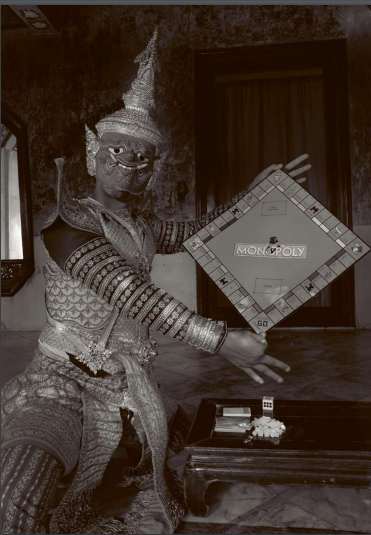 The leading character begins his journey from the Laotian capital Vientiane, crosses the Mekong River into Thailand, and soon heads for Bangkok. 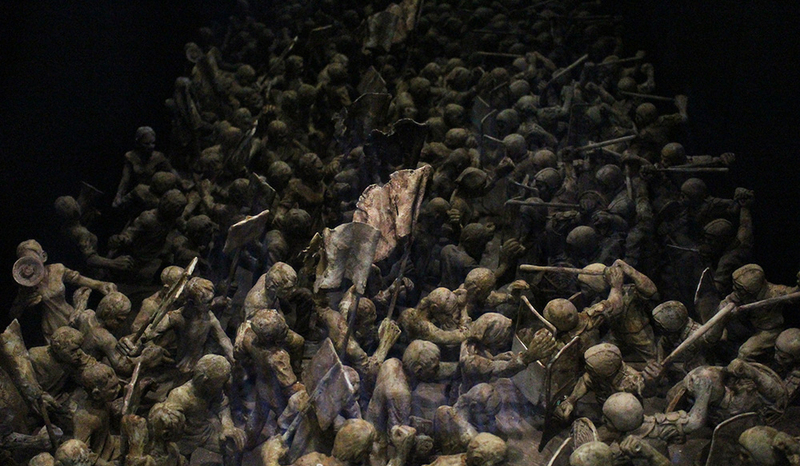 On the way, he confronts many obstacles, among them devils and evil spirits as well as an army of soldiers. Overall, it’s a confusing world dominated by technological advances and online social media. 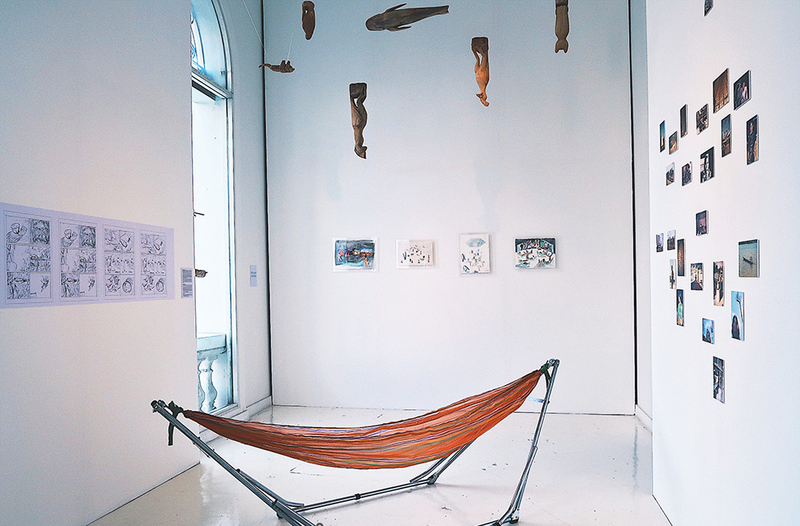 Artists from Ho Chi Minh City, Vietnam came together in 2012 in a bid to find ways of presenting their ideas through non-formal visual art forms. The result was a series of artistic expressions from a unique cultural point of view. The group consisted of artist Thao Nguyen Phan, curator Truong Cong Tung, and author Arlette Quynh-Anh Tran. Together, they experimented with new ideas that went beyond the limits and ventured out into unfamiliar territories. In the process, they discovered “Jrai Dew”, a belief traditional to an ethnic group called Jarai who inhabits remote areas in the highlands of central Vietnam. 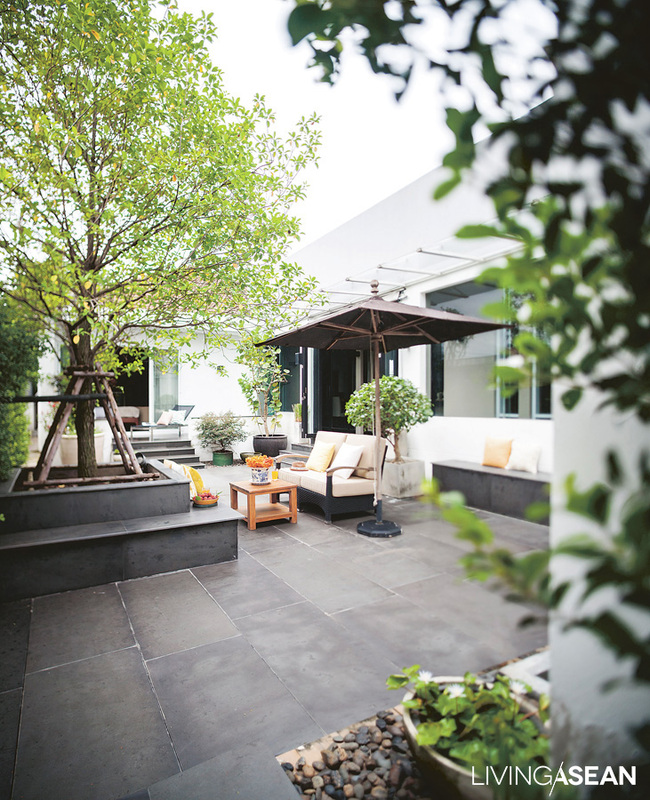 According to an explanation by Art Labor, the Jarai people believe that humans are an inextricable part of the cycle of nature, a process in which everything is continuously cycled in various forms of the environment. After death, everything begins again like tiny drops of water that form in the cold of night and evaporate when temperatures rise. Likewise, people and the forest in which they live go through a never-ending cycle of change. As the gems of morning disappear, they signal the opening of new opportunities for other things to grow. 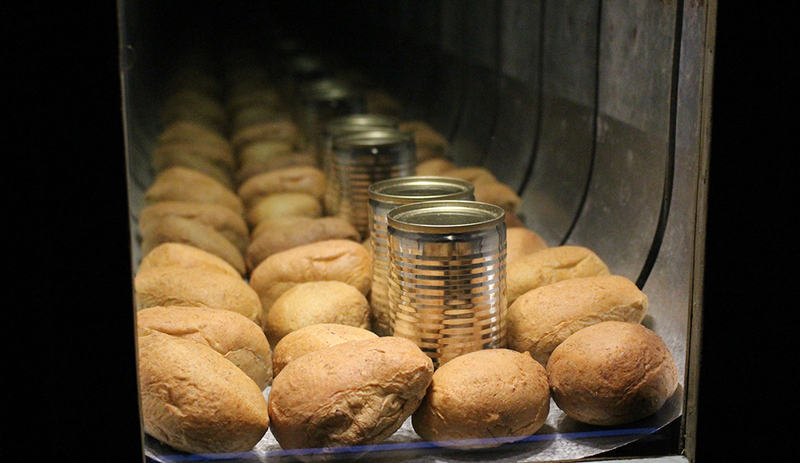 For the Bangkok Art Biennale 2018, Art Labor debuts “Jrai Dew: A radicle room”, a unique installation that took three years in the making. 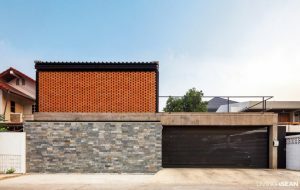 It’s designed to communicate such a thought provoking idea from the highlands of central Vietnam to its audiences beyond borders. “A Parade for the Paraders” is a triple-screen piece of video art by former members of the Singapore Military Marching Band. The musicians come together to play “Steamroller” in a lively and animated fashion that has made the soldier jogging song more interesting and exciting. The band members are seen without full dress regalia as they march past a deserted school. The relaxed and unconcerned parade may be an unfamiliar sight to see, but the music and the formation are a serious matter. 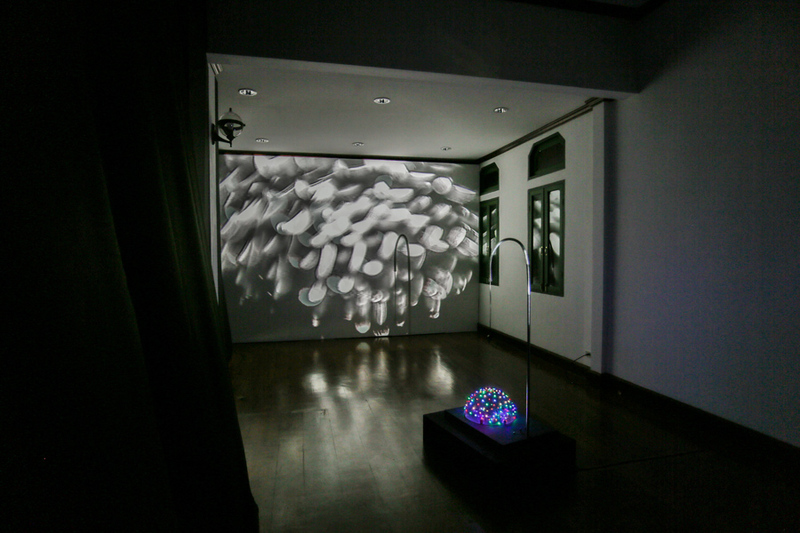 Kray Chen, formerly a member of the marching band, explained that his video art presented a contrast between playfulness and serious performances. The real military marching band spent many hours practicing to achieve perfection before they could play as part of National Day Parades on August 9. His band did not. A harsh reality of life that few people knew was that military marching music was taken so seriously that under normal circumstances, its members weren’t even allowed to perform live in public. 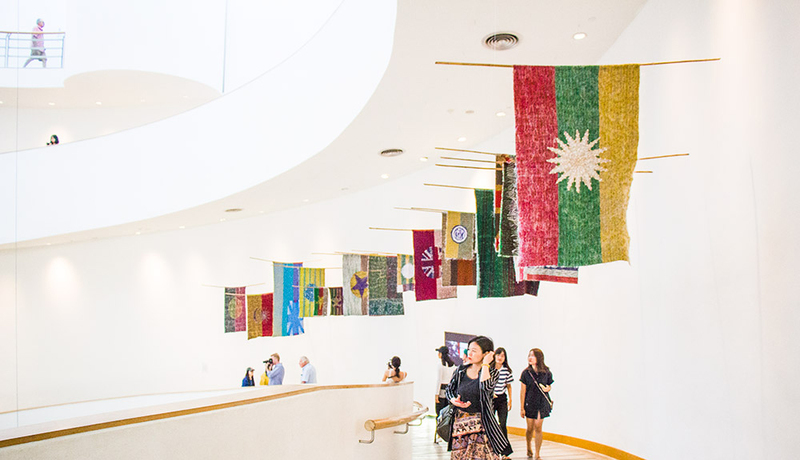 “The Outlaw’s Flag” by Thai artist Jakkai Siribut is an installation that calls attention to the plight of the Rohingya refugees. Like a very exciting contest, the work of visual art consists of 15 flags that no one knows to what country or people they belong. The only known truth is that the humanitarian crisis caused by violence and discrimination in Myanmar has sent hundreds of thousands of refugees fleeing into neighboring countries. The imaginary flags on display send a message of hope for the future of the Rohingya and urge countries in the region to cooperate in a bid to end terror and suffering that the refugees are facing. 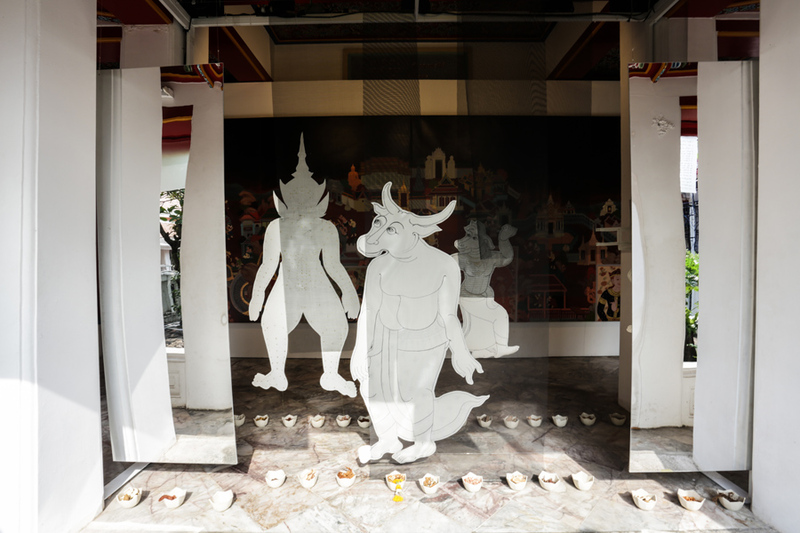 The artist is regarded with respect and warm approval for drawing attention to pressing socio-political issues, most notably the challenges faced by the followers of Buddhism in Thailand. 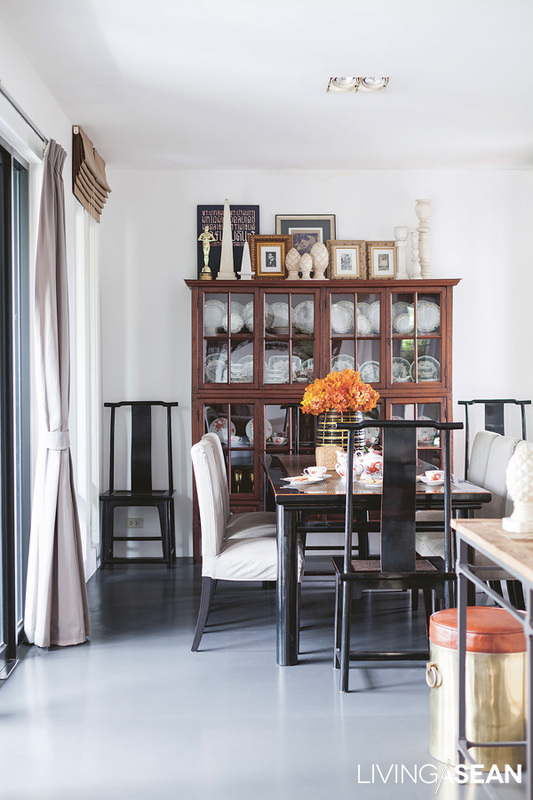 He sees the tendency to consider material possessions more important than spiritual values as having a detrimental effect on the Thai way of life. A versatile artist, Jakkai is skillful in using textiles, embroidery techniques, photography and video art in creating beautiful installations that get people to think about the problems that need to be dealt with. 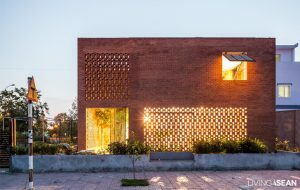 He has exhibited at various art destinations in America, Europe, and Asia, most notably the Asian Art Museum in San Francisco, the Asian Civilizations Museum in Singapore, and the Vebih Koc Foundation in Istanbul. In earlier times, an “art work,” for the most part, simply reflected the ways of life and daily routines of human beings at the time. Stone age cave paintings tell us of the progression of early civilization from tribal animal hunts to creation of tools & utensils by shaping and carving done with the human knowledge and experimentation of that time. Nowadays, though, art has become a reflection of the progress of the human mind and of creativity itself, distilled and filtered through experience, imagination, and the fashions of the time, to express personal insight and inspiration through visual arts, sculpture, painting, and even architecture. 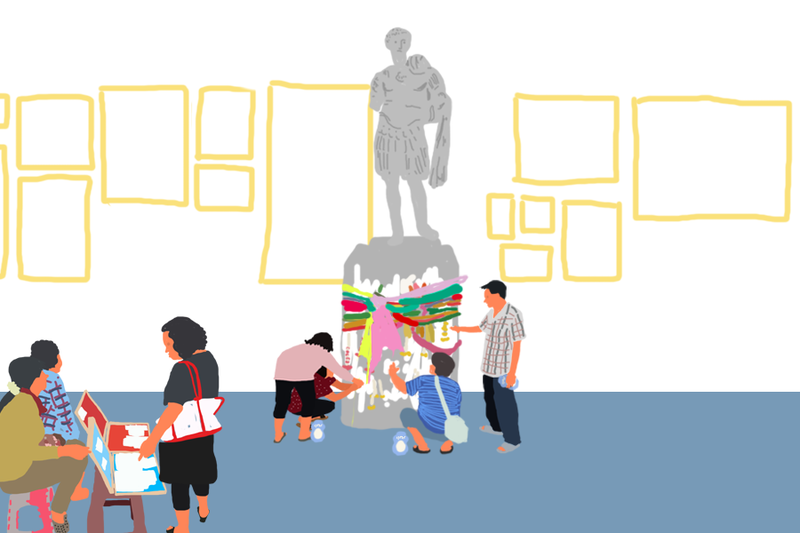 In bringing art works together for exhibition, care must be taken that each work, full of historical value, is experienced according to specific requirements and protocols so that it will not be harmed or deteriorate before its time. 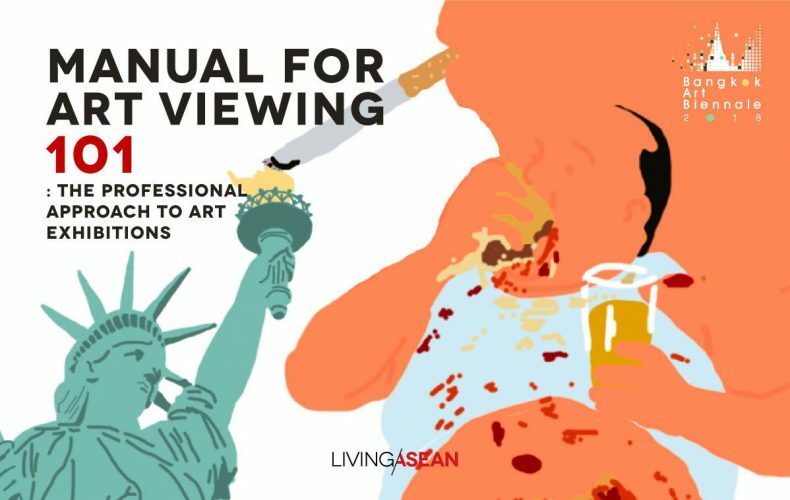 Because these art works are so precious, we are offering Living ASEAN readers some guidelines for their proper viewing and study. Museums and art exhibition centers generally make it a priority to ask visitors not to take pictures. This is because some paintings and sculptures may have reactions to flash photography that cause premature deterioration of the pieces being photographed. Both cinnabar and yellow from lead chromate darken over long-term exposure to light. Realgar yellows may become fine powder incapable of restoration to their original condition. This is why many museums enforce standards for direction and intensity of light, and why museums are often darker than one might expect. 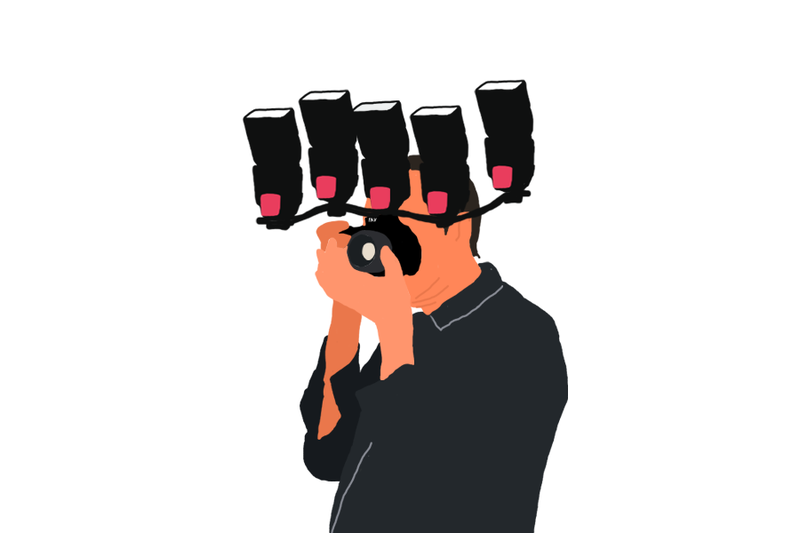 The use of photographic accessories such as tripods and selfie sticks can block people from easily walking around as well as diminish the aesthetics of other visitors’ viewing experience. It is also important to avoid physical contact with exhibits. Many art works are labeled “Don’t touch,” or are protected by barriers, since some art works may react to human body temperature much as they do to light. 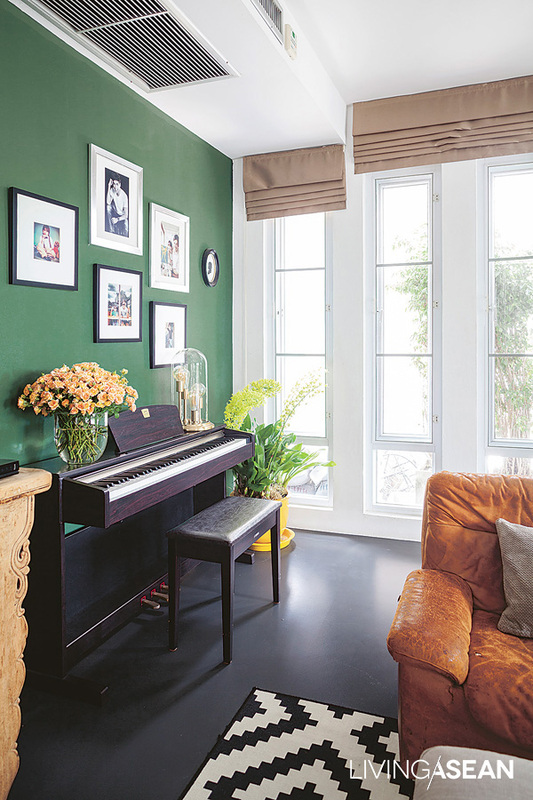 Certain paintings may change color or retain fingerprints if touched, and direct touch can cause abrasion, scratching, or punctures from fingernails or palms, causing breaks, tears, disfigurement, or premature degrading. On the other side of things, though, some artists use art as a more direct means of communication, and give visitors the opportunity to interact freely with their works, so some art pieces actually may be touched! Just watch for a “Please touch” sign at the exhibit area. Basic art show etiquette calls for limiting vocal communication. Museums and art exhibitions are common areas with large numbers of visitors, and loud noises or conversation can disturb others. Running or careless walking, as well, may cause collisions both with people and with exhibits. 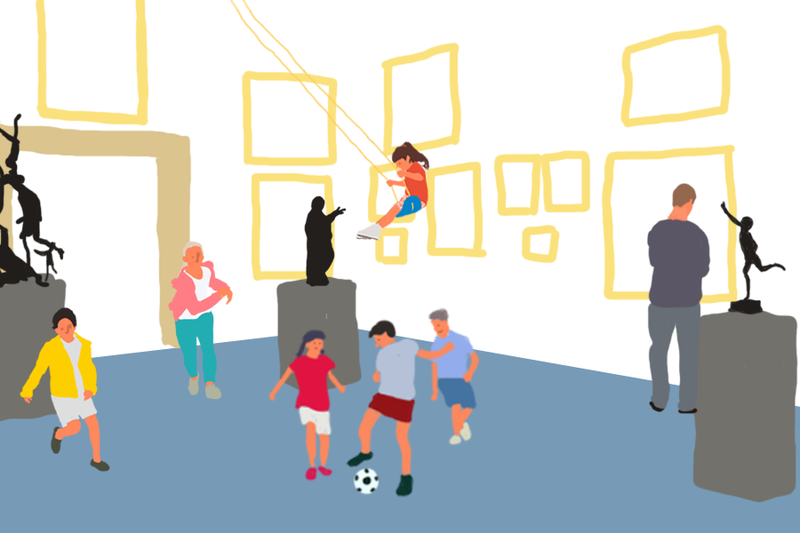 Many museums insist that children under 18 be under the close supervision of their parents or guardians at all times. 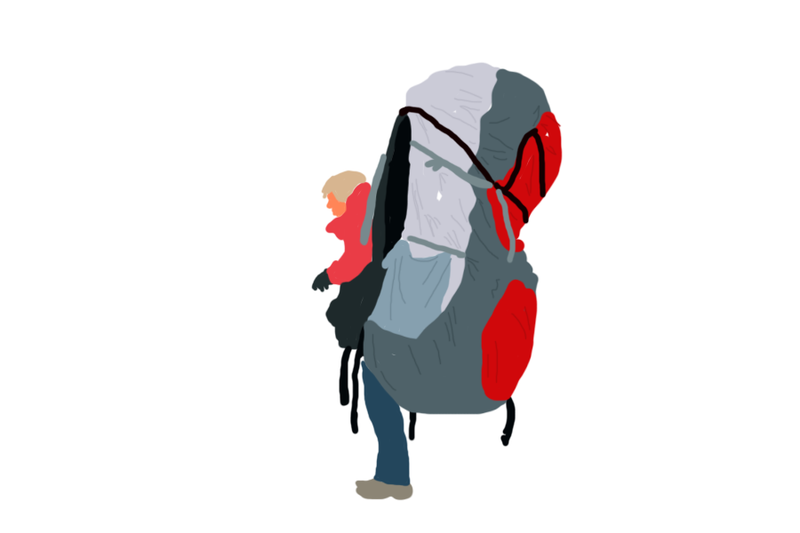 Many museums or art exhibitions forbid carrying personal bags into exhibition areas; this may include backpacks, suitcases, or large shopping bags, as they may annoy or block the path of other visitors, or cause damage to works on display. A suitcase on rollers can collide with a display, or a backpack strap can catch on one. 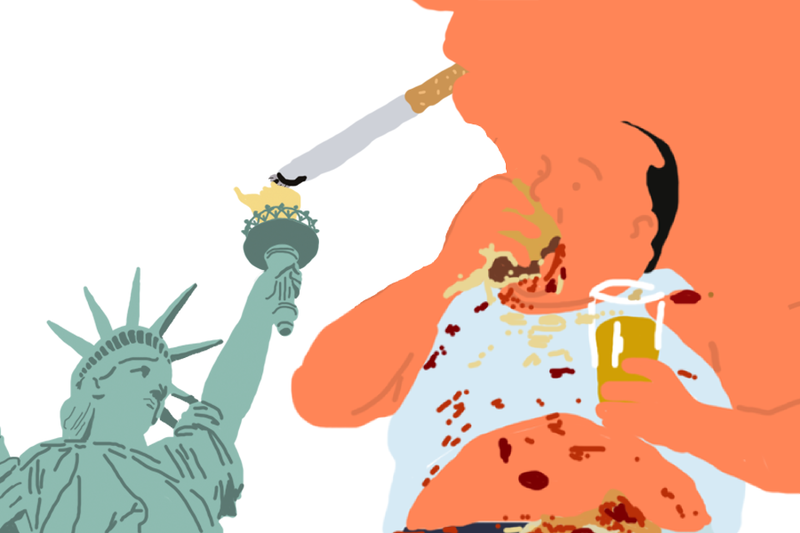 Smoking, eating, or drinking near exhibited art seriously risks damaging it, which is why many museums do not allow bringing food or liquids in, or even in outdoor exhibit areas. And simple good manners would obviously mandate not smoking in an exhibition area. Many art works need to be viewed in specific ways. Some large paintings need to be viewed from a certain distance to properly experience them. Besides giving consideration to not blocking the view of others, we need to be sure we get a full impression of the meaning the artist is communicating, which too much attention to a single point may make difficult. Some museums have dress codes. If planning a visit to an art exhibition or museum, be sure to dress up to international standards: fully dressed, no open-toed shoes): this shows respect and is acceptable almost anywhere. This may depend on local traditions: for instance, museums in some countries require women to wear head coverings. In any case we should educate ourselves about such things before embarking on international travel to visit art exhibitions. Finally, before visiting an exhibition always read signs, announcements, or guides provided by the curator or institution: this will help you have a worry-free experience. 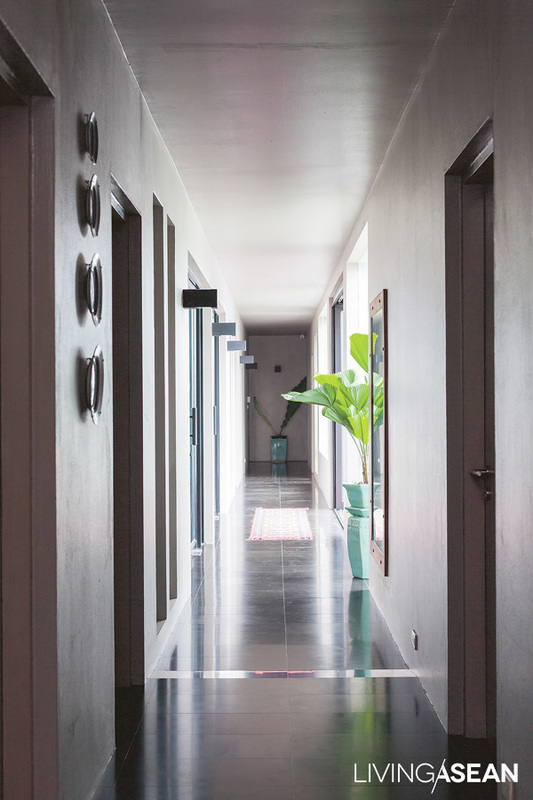 Each location involves different customs and viewing rules, and studying and understanding these details aids us in developing a truly professional approach to the enjoyment of art. 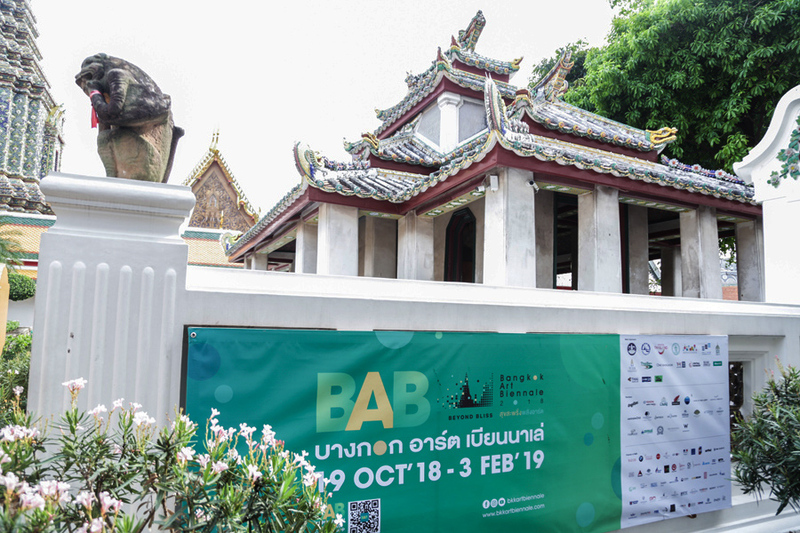 The contemporary international art festival Bangkok Art Biennale 2018 had its formal opening last October 19th. This fair has reinvented our own Bangkok as a major art venue on a level with Venice, Berlin, Paris, and Singapore. 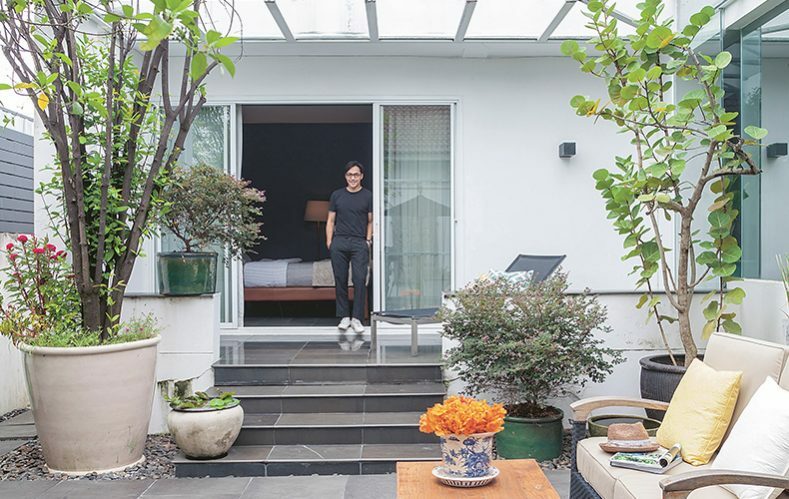 Here, now, more than 75 famous domestic and foreign artists have showings at various important locations for us to enjoy what has been called “resplendent, energetic art,” as Bangkok itself becomes a prominent landmark in the contemporary art world. From now until February 3rd, 2019.